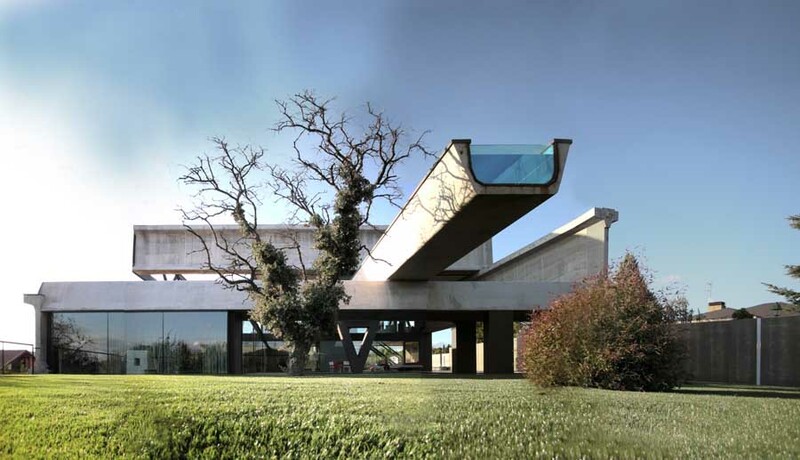 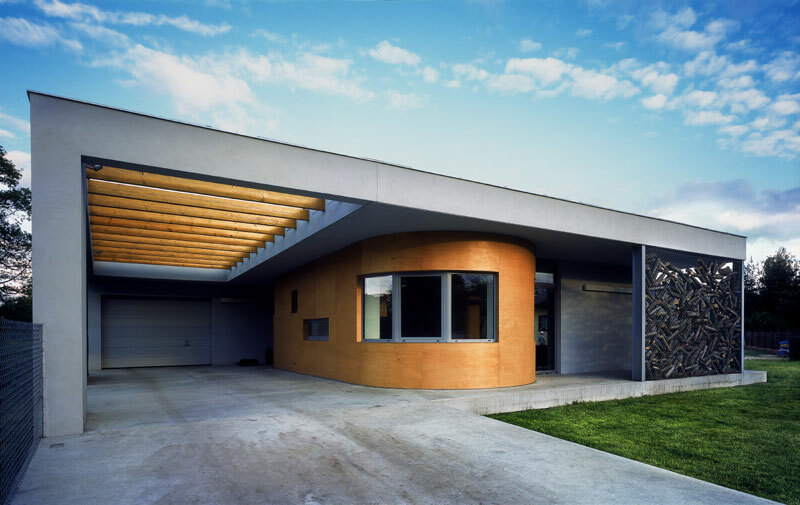 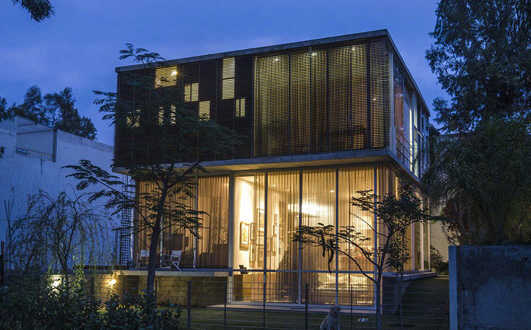 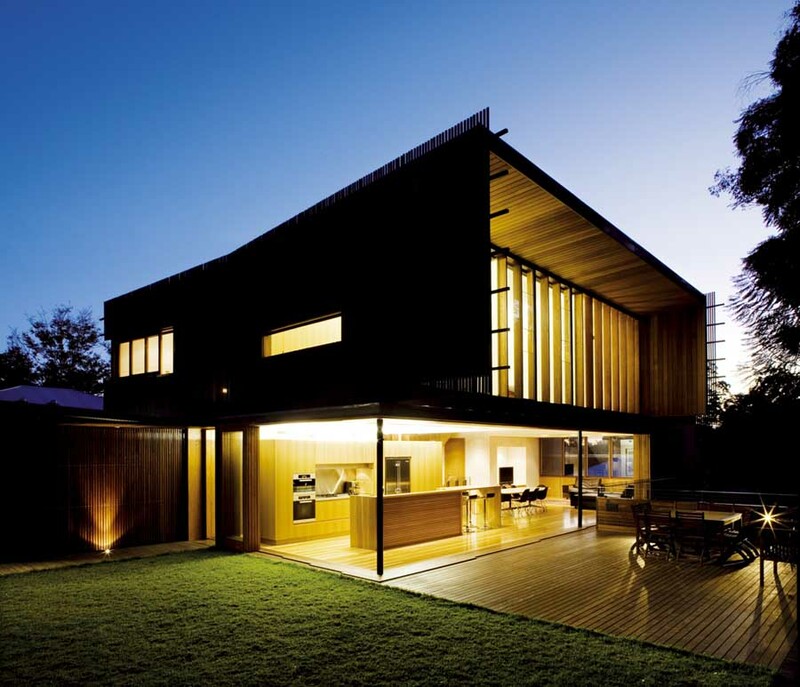 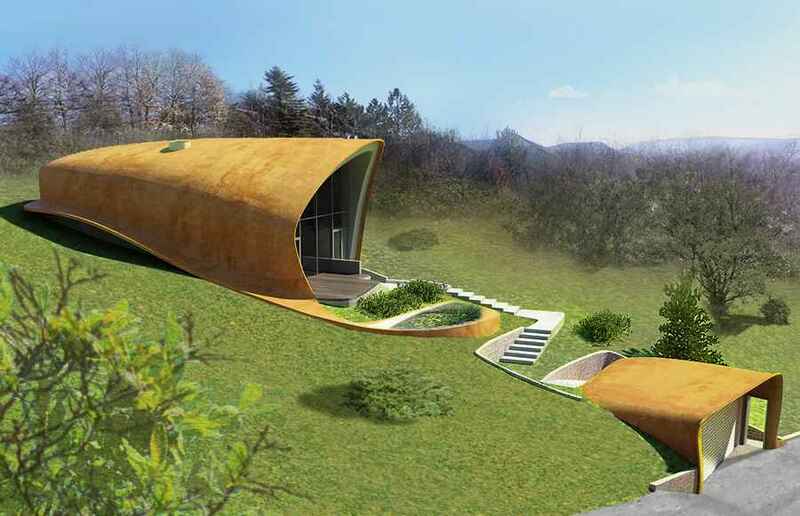 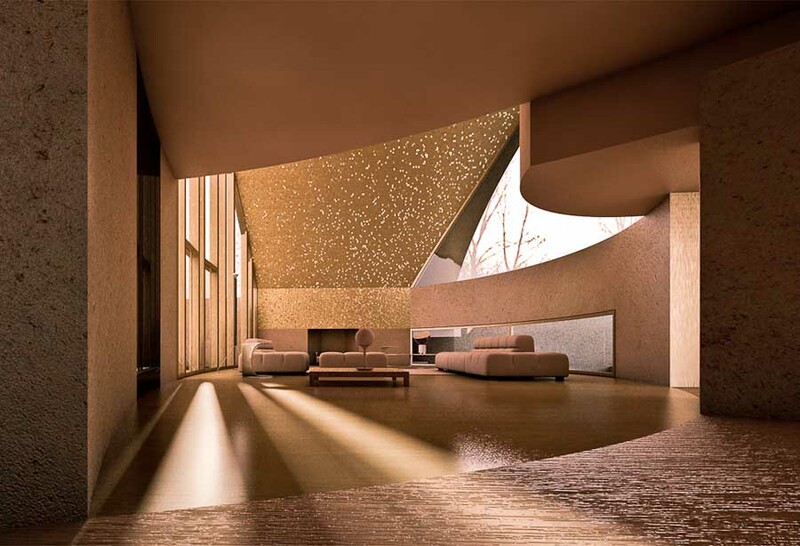 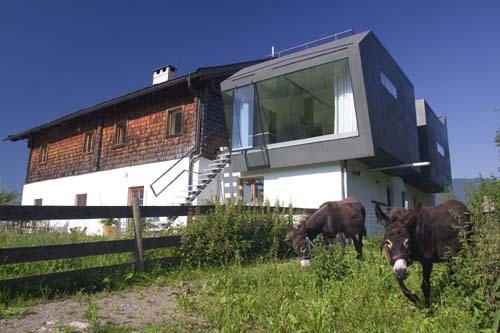 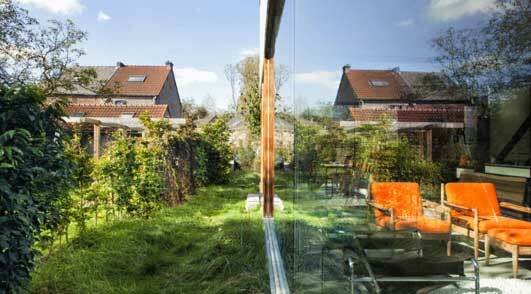 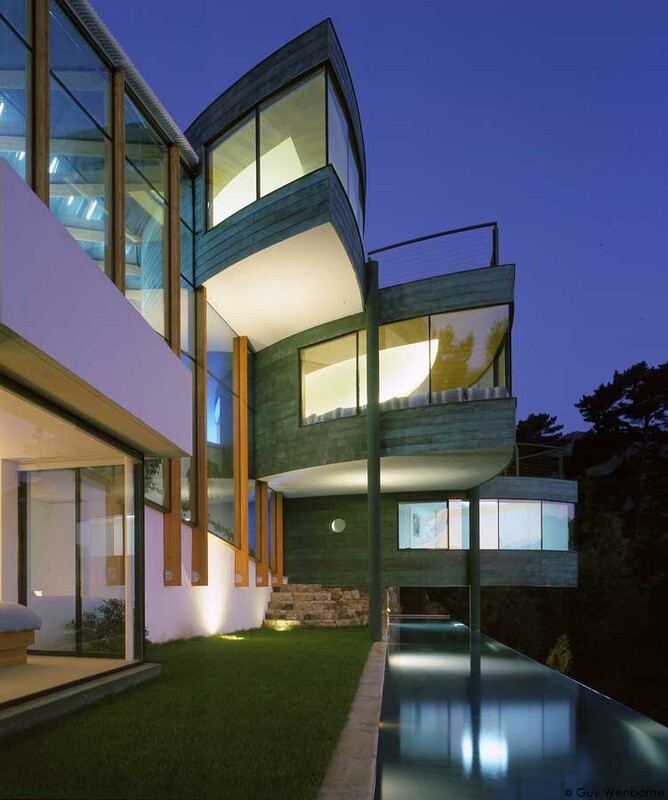 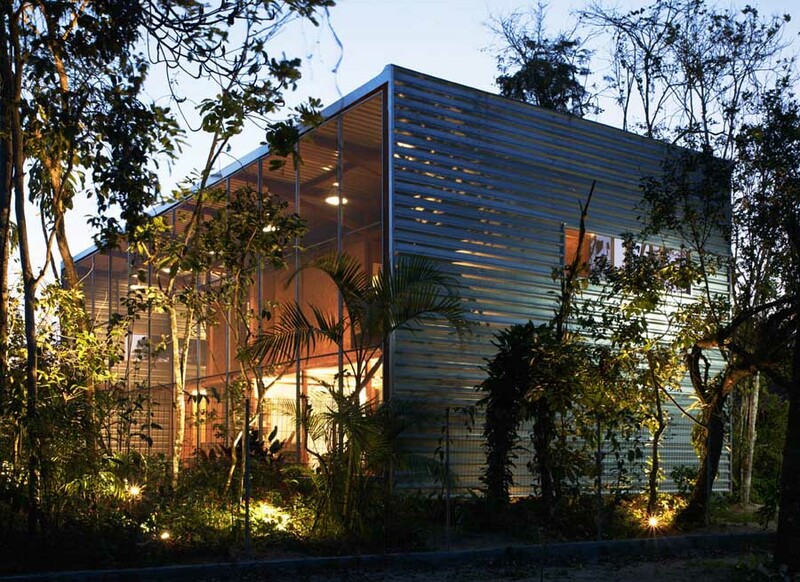 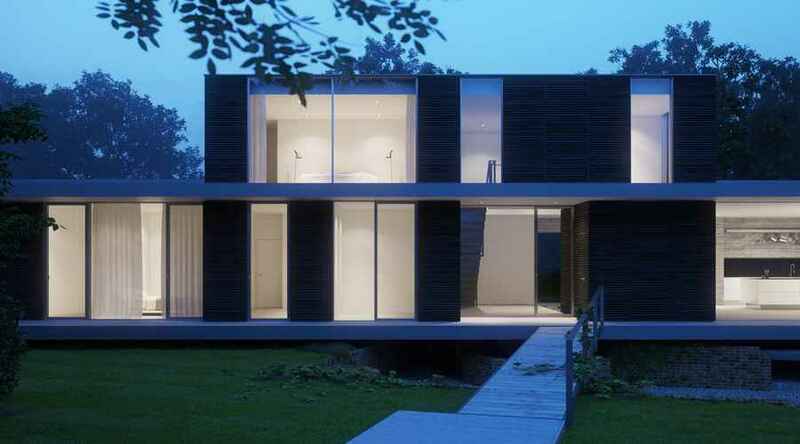 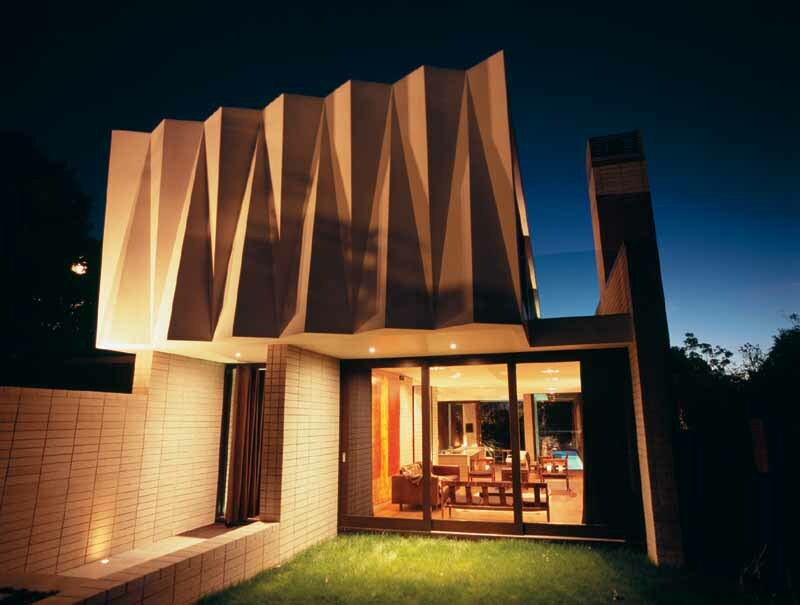 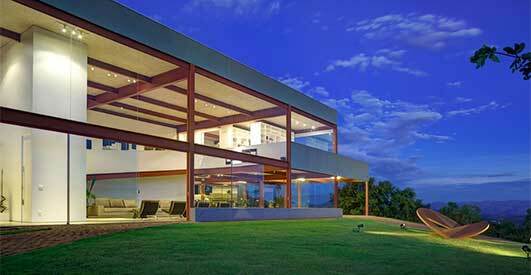 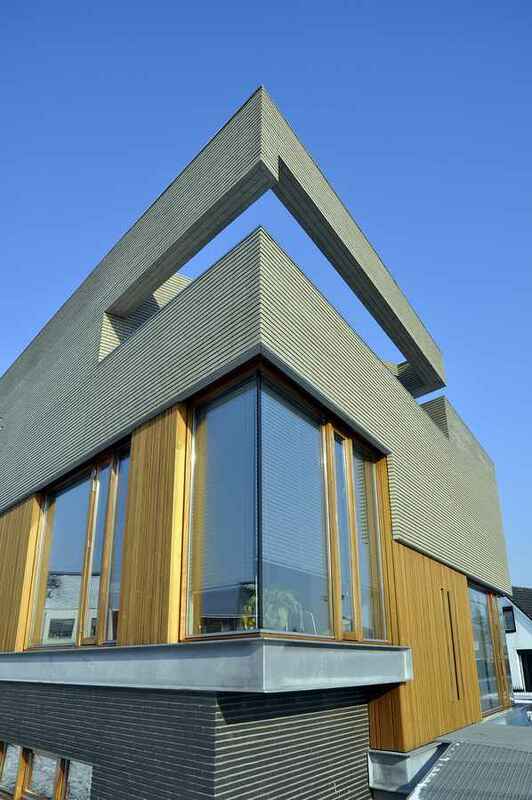 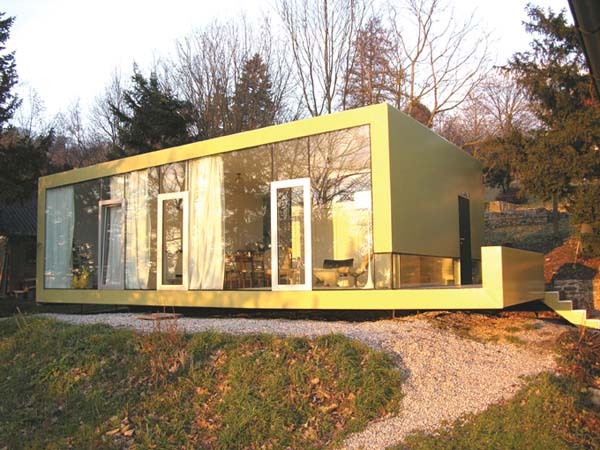 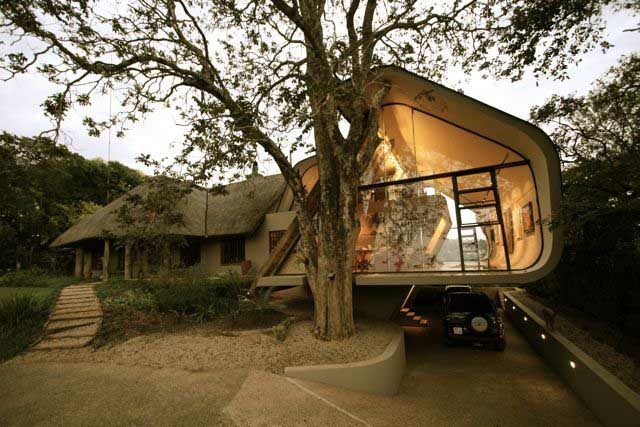 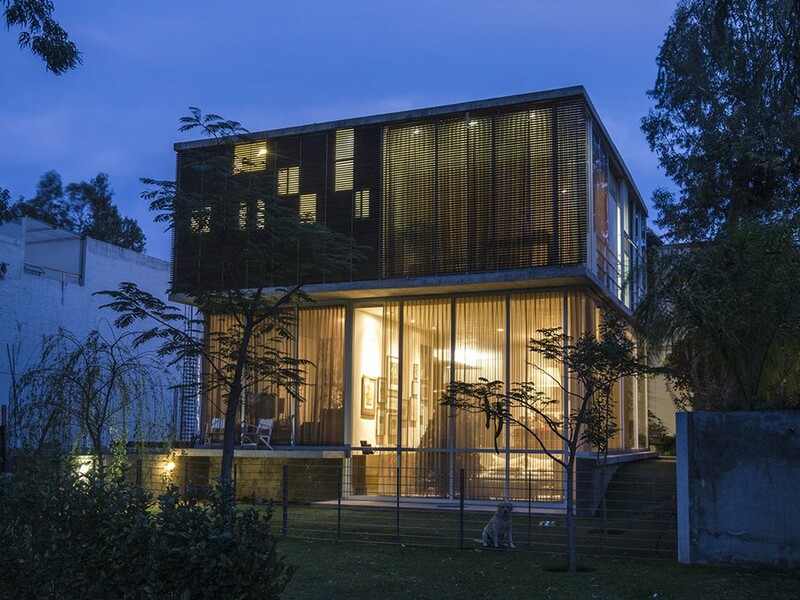 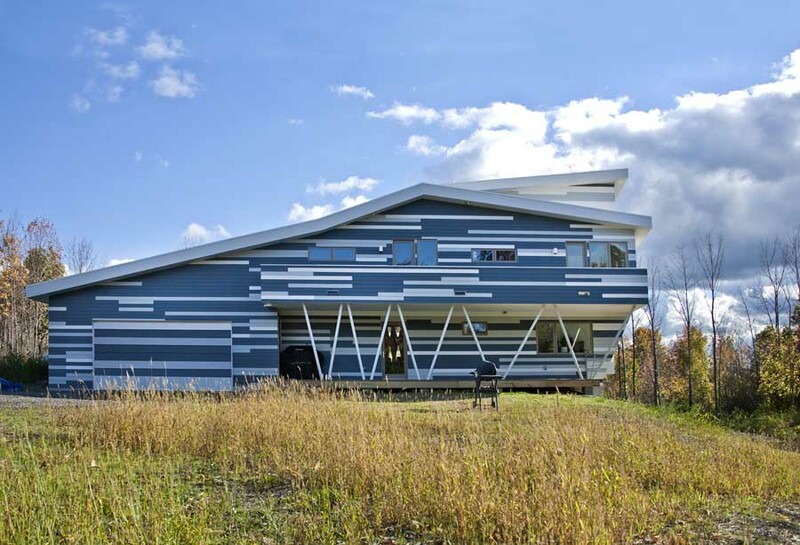 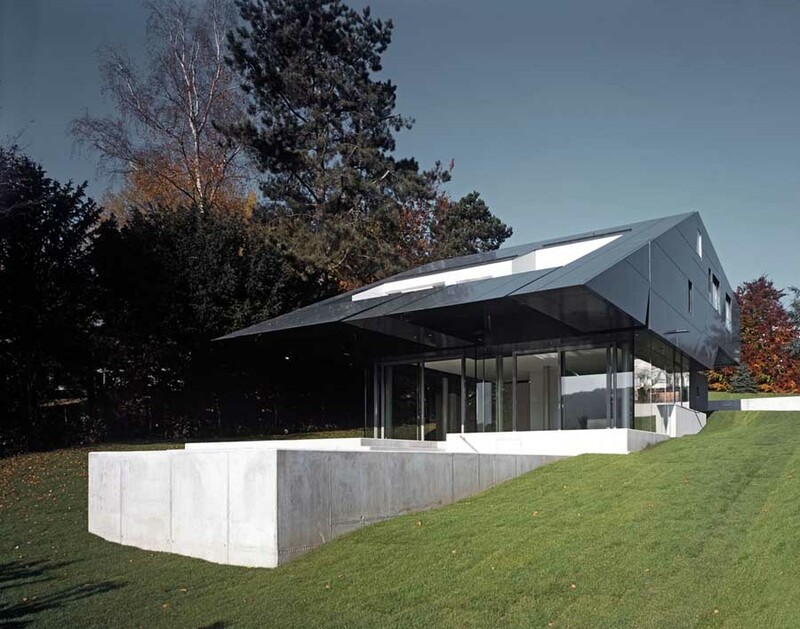 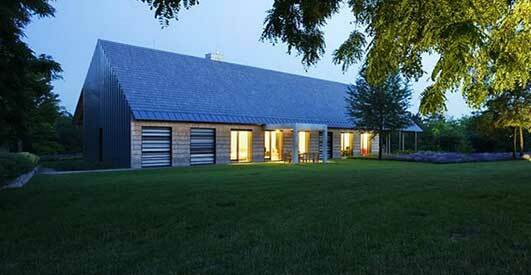 e-architect have selected what we feel are the key examples of New Home Designs. 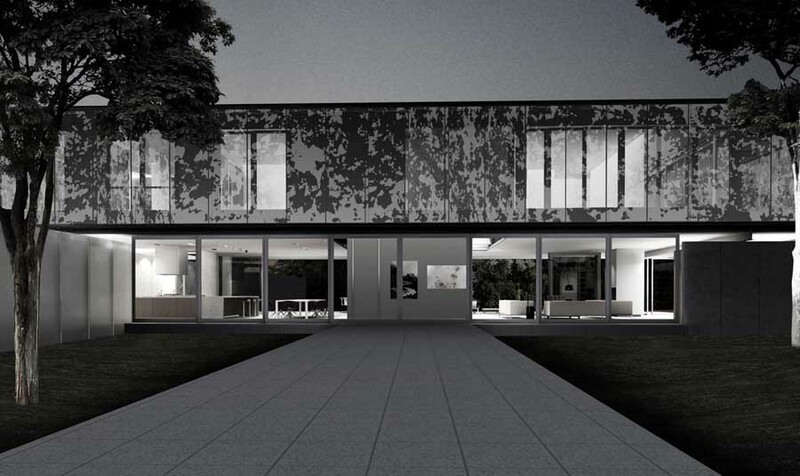 We aim to include New Homes that have strong design intent. 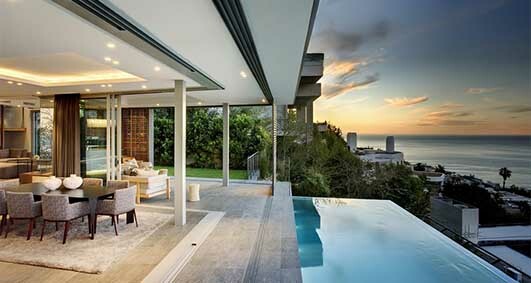 We cover completed Home, new residential designs and architecture competitions across the world. 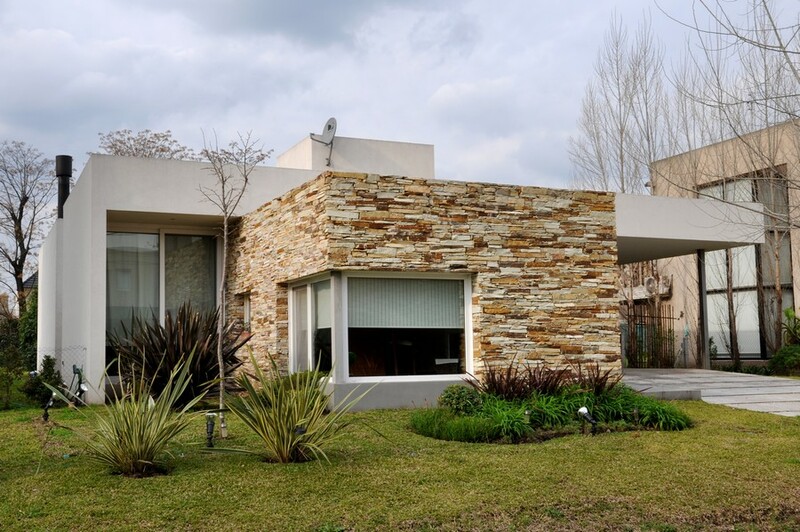 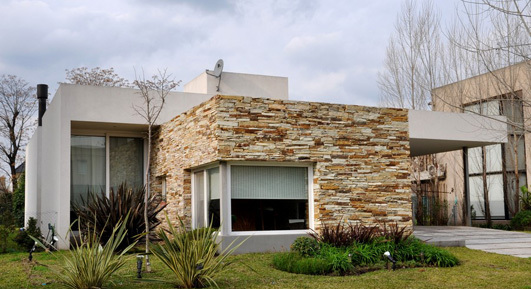 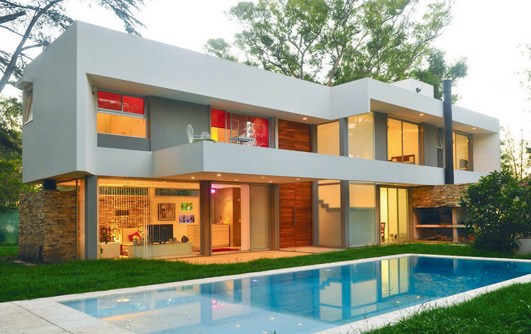 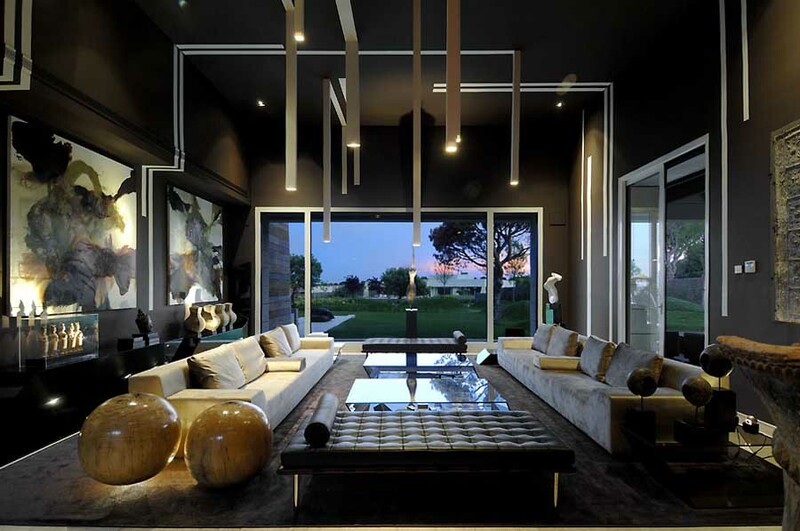 Our focus is based on contemporary residential buildings. 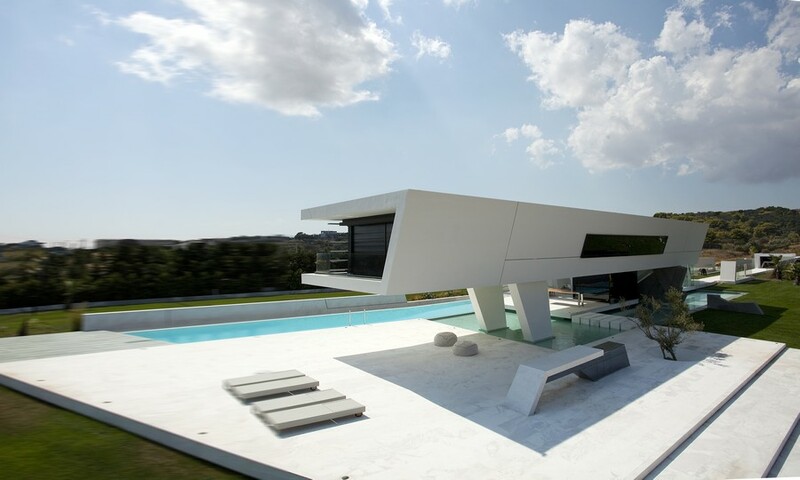 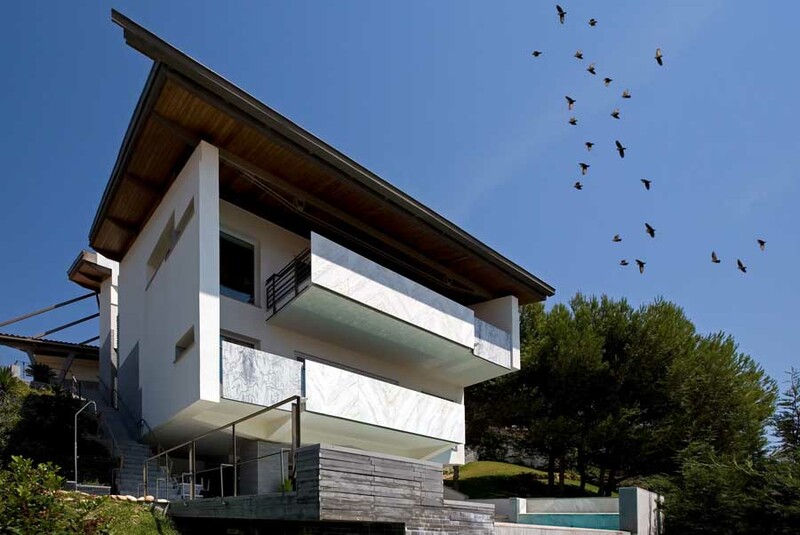 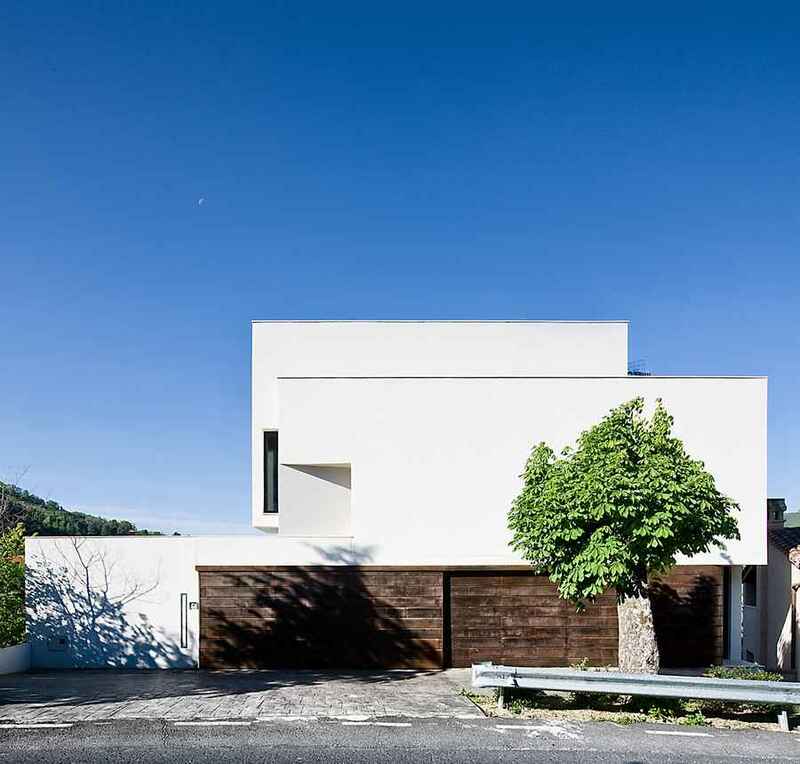 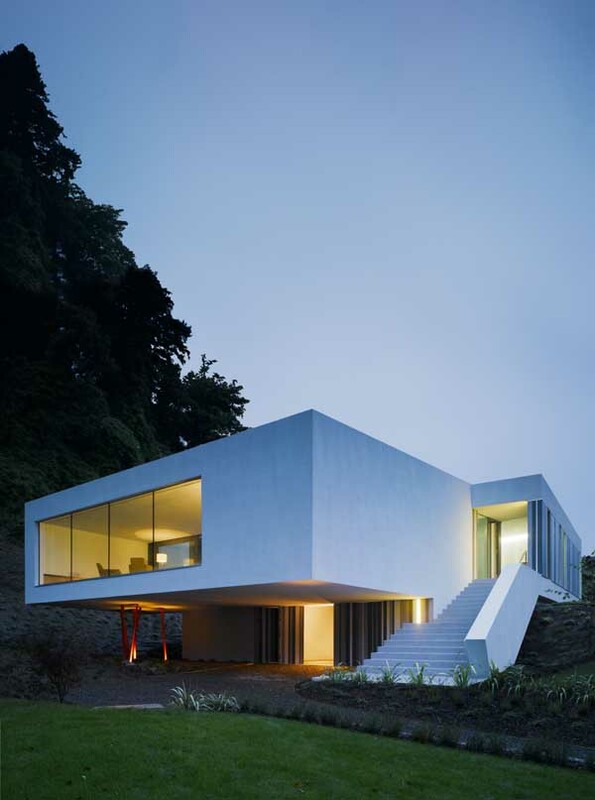 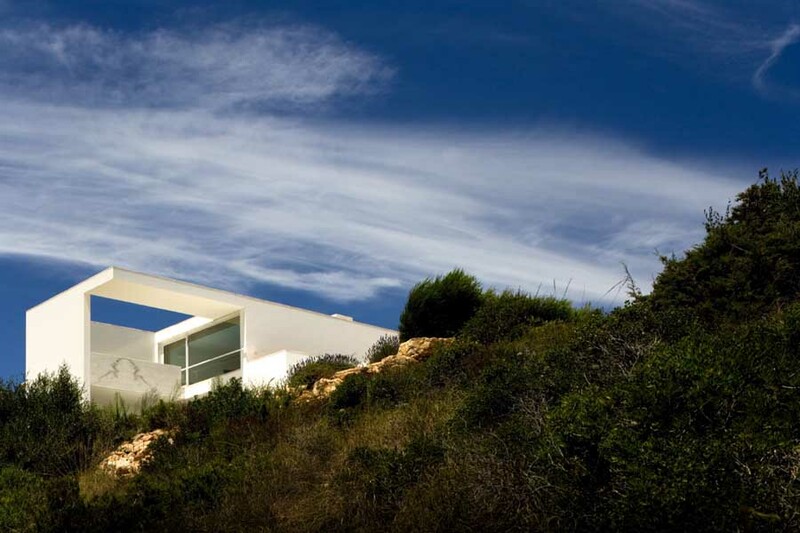 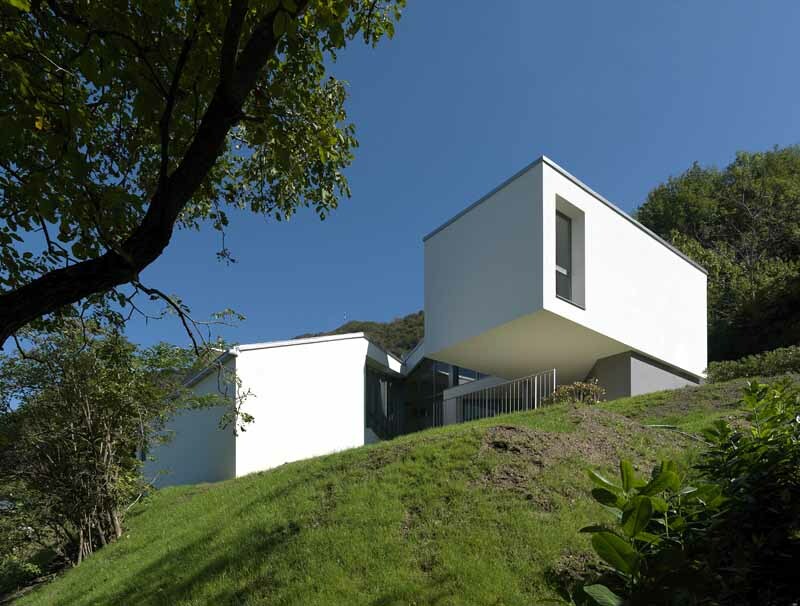 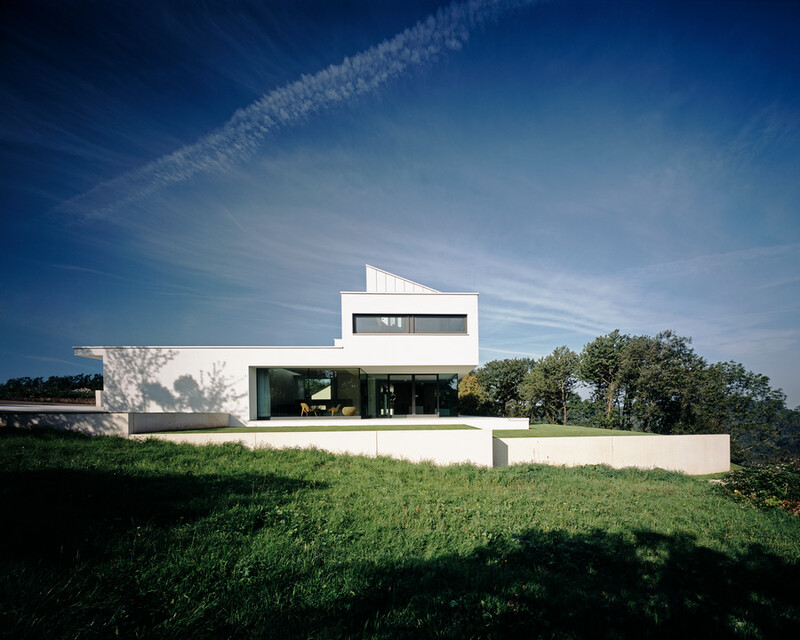 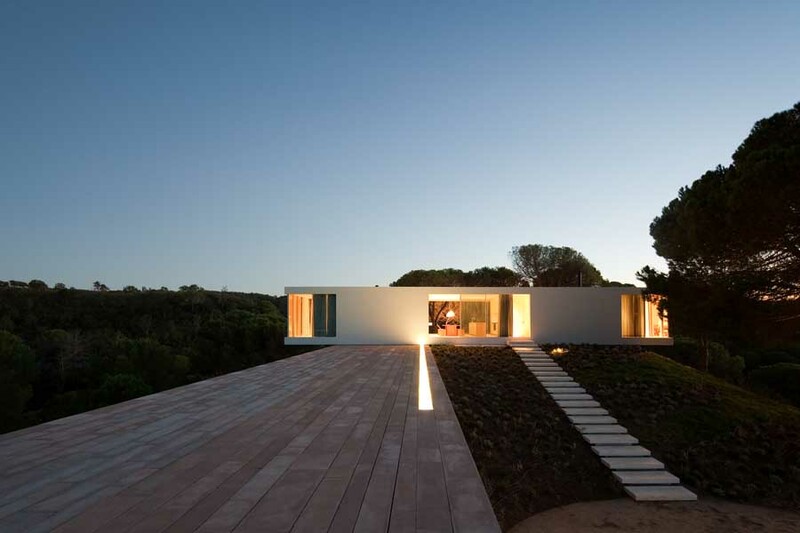 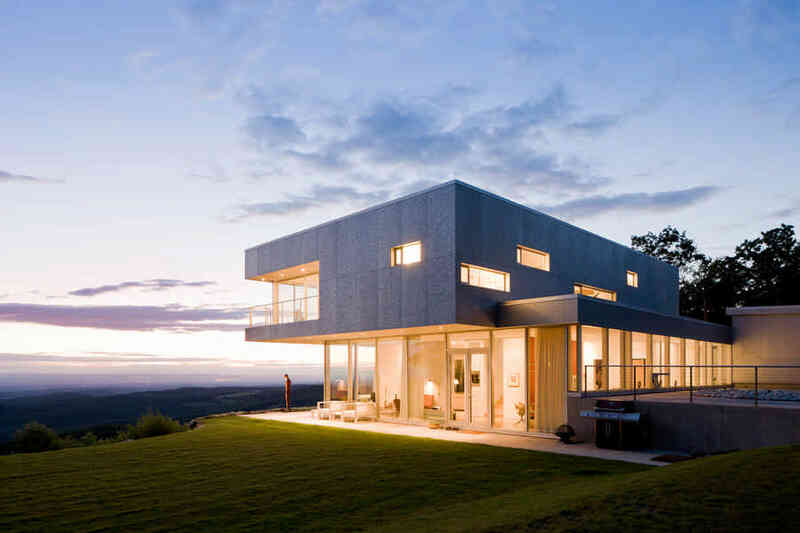 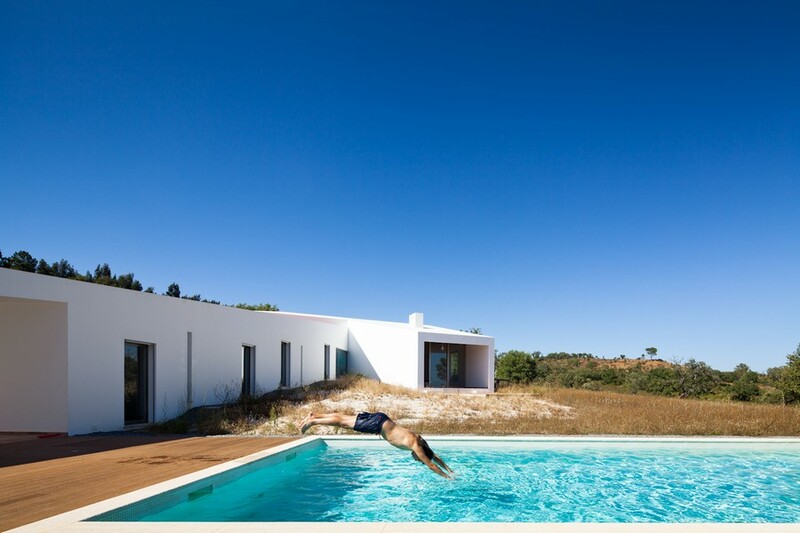 A simple white-rendered residence beautifully located on a gentle mountain ridge. 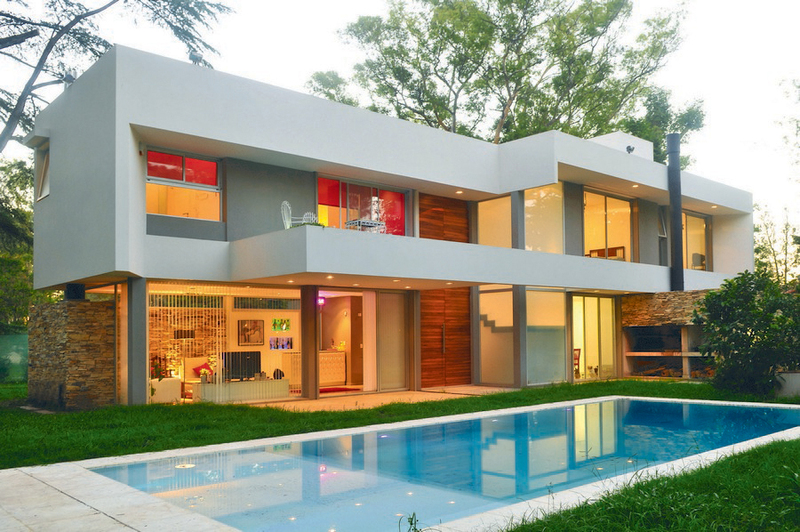 This project was done in collaboration with the client who wished to build his own home. 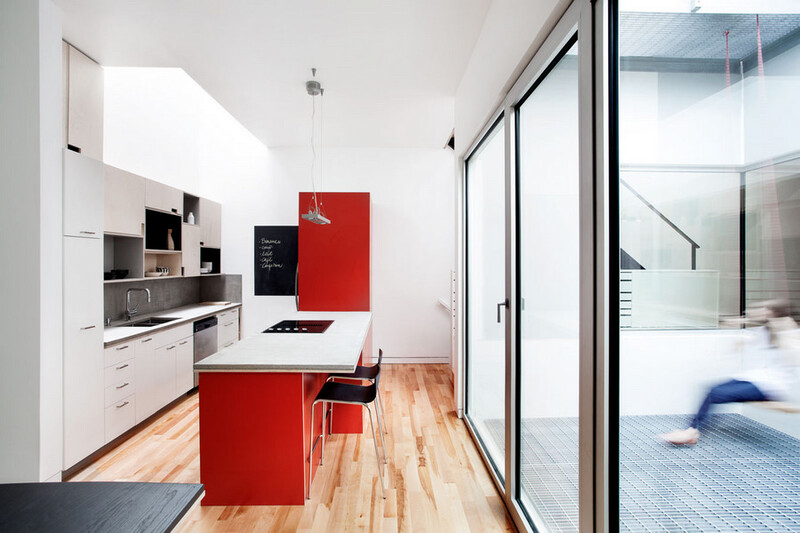 The site is located in a back alley of Montréal’s Plateau neighborhood and the design reflects the patchwork of extensions and renovations typically found in Plateau alleyways. 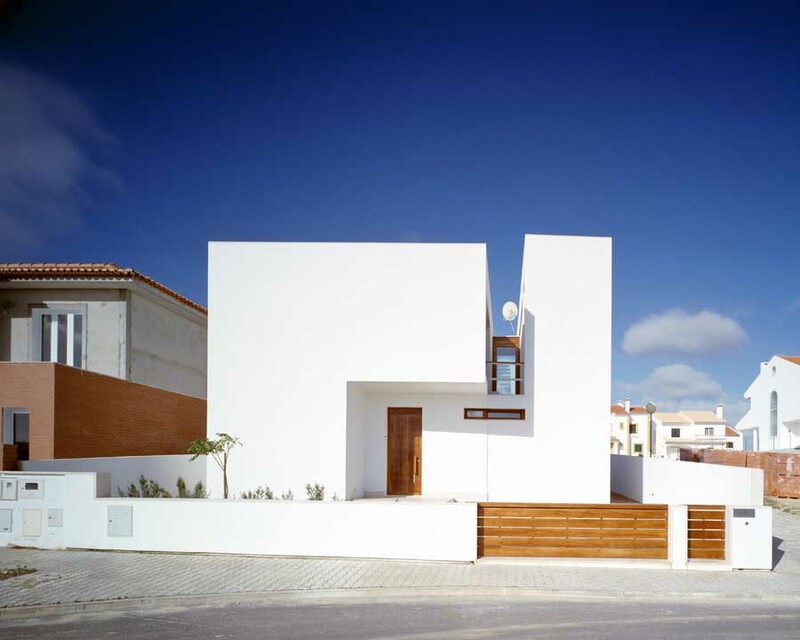 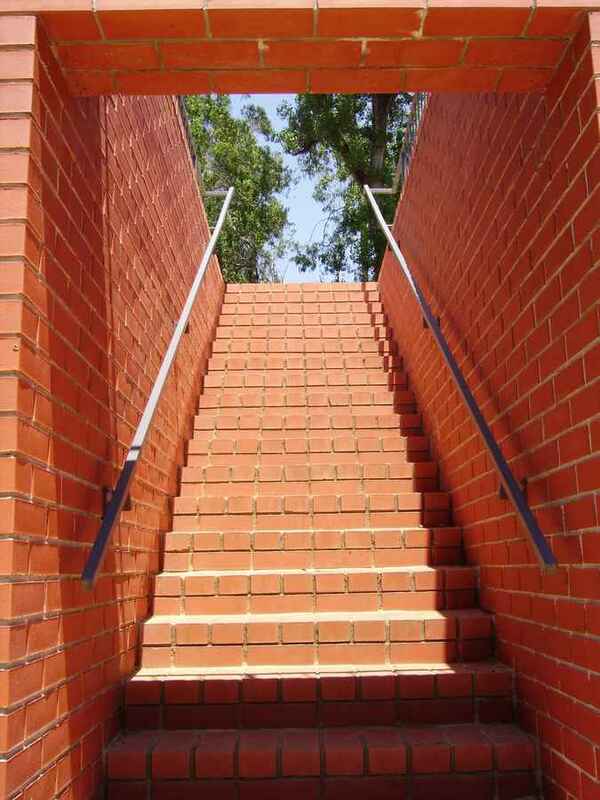 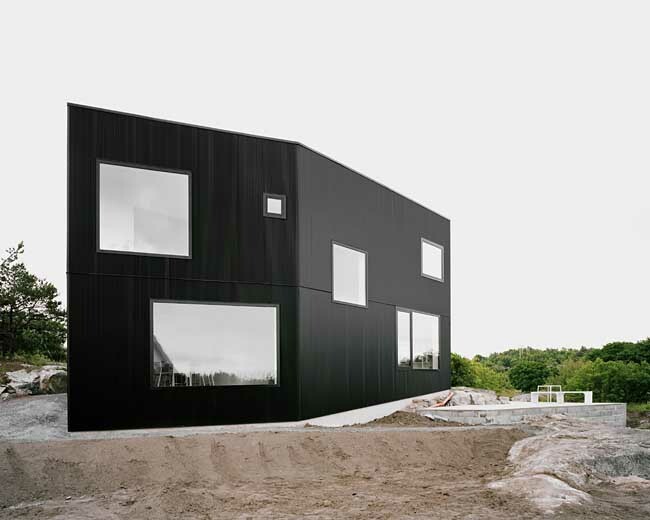 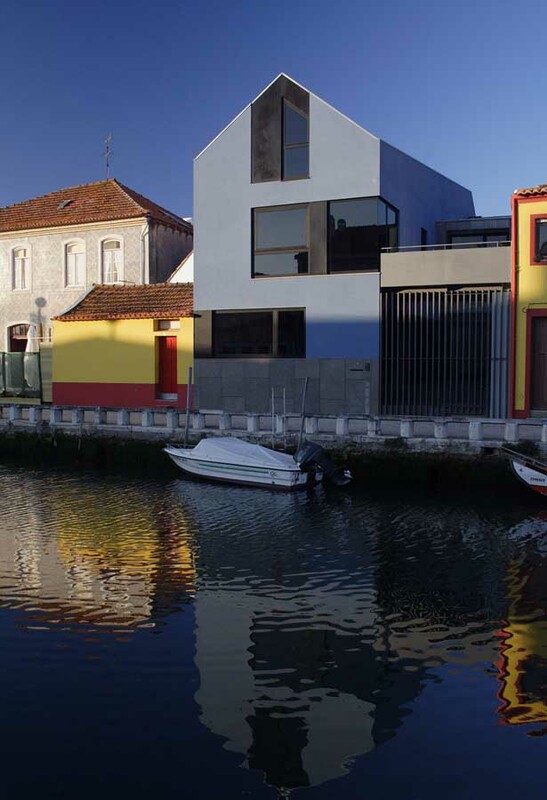 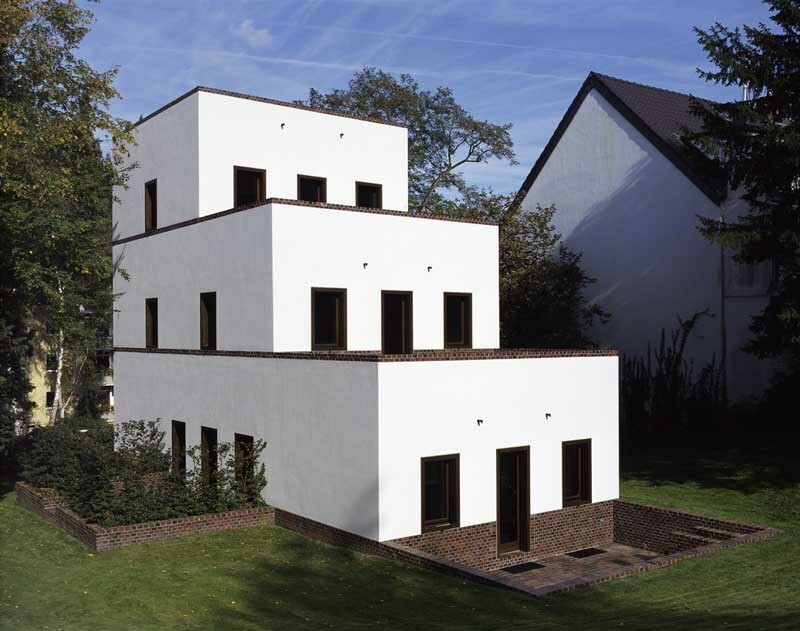 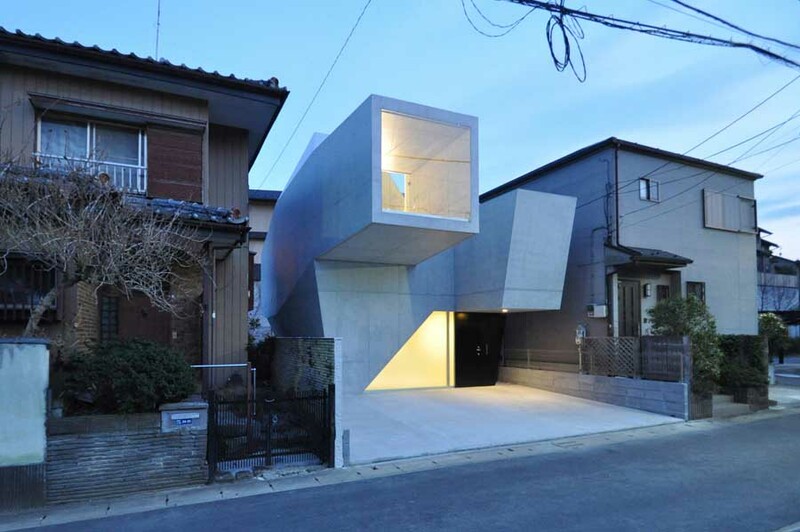 The constraints of the site called for a house that was built upwards versus outwards. 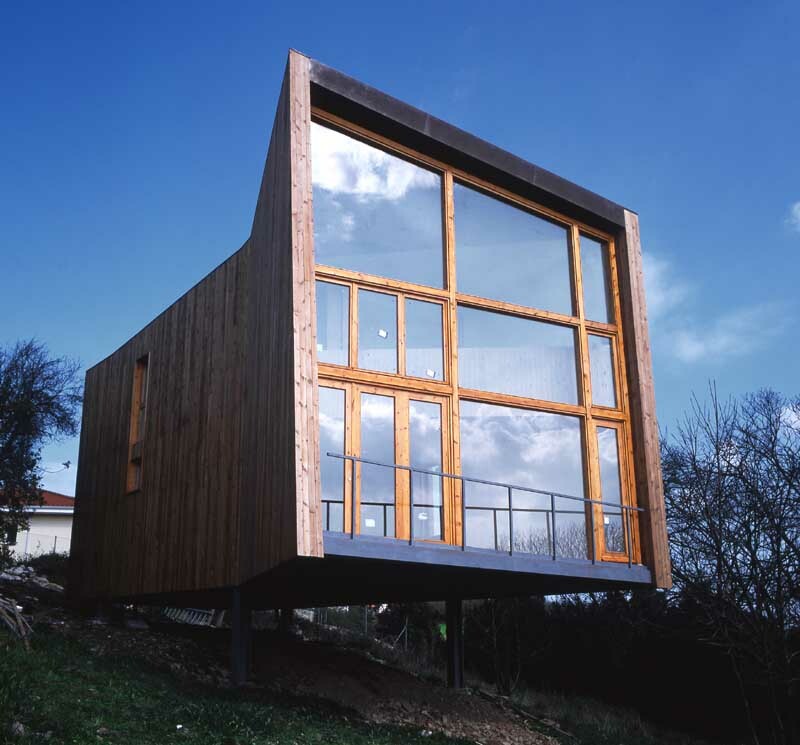 Four boxes clad in different materials are stacked one on top of the other. 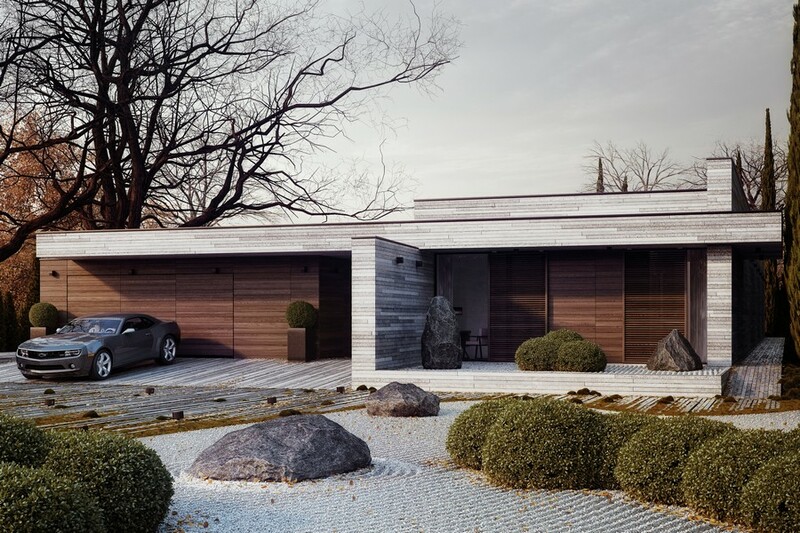 On the house side, from one of the lot’s fronts, access is gained to the garage, which is hidden from the garden behind a stone wall. 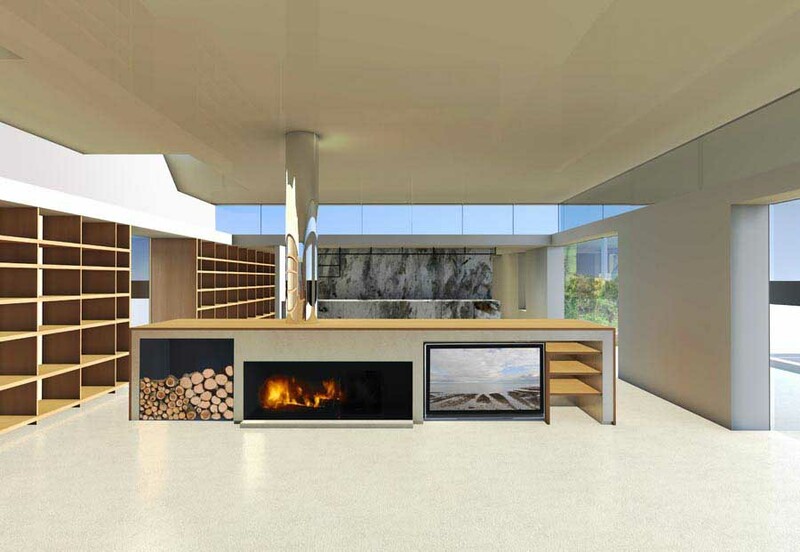 The garage is directly related to the kitchen/dining room, to serve as an extension for large meetings and connecting it to the service areas. 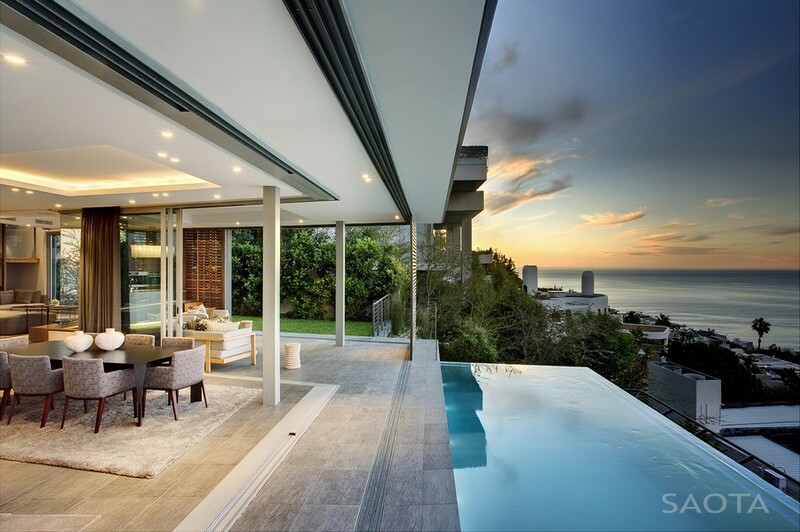 After this is the sitting room, completely made of glass to integrate the garden to the interior and enjoy the views onto the pool. 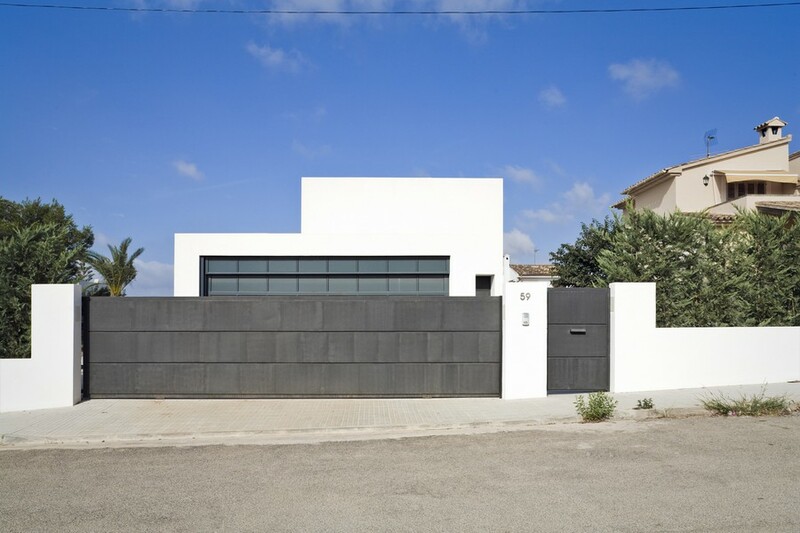 The house, developed in one floor, combines the different rooms inside an architectural box made of stone walls, masonry and glass. The front contains the first stone volume, which includes the master suite. 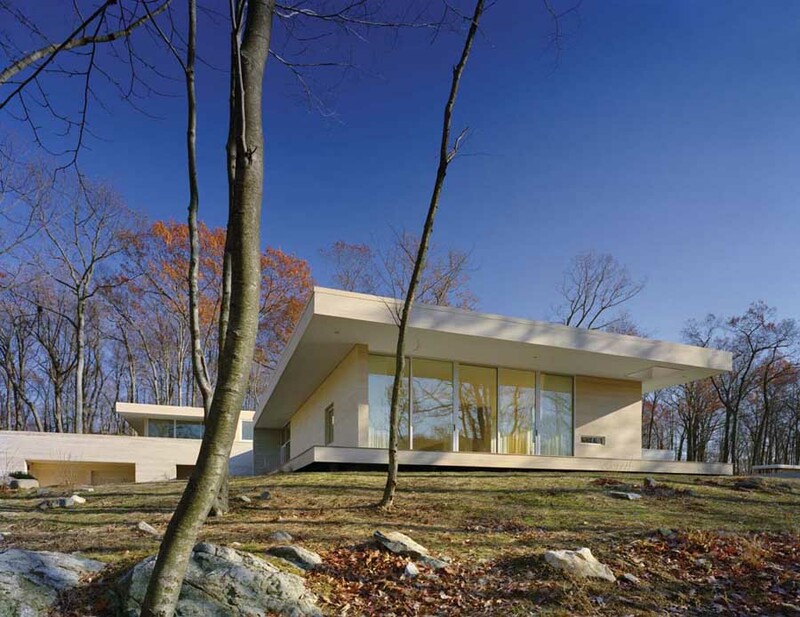 A horizontal glassed window located at the floor level, de-materializes this stone wall and connects the master suite with the exterior. 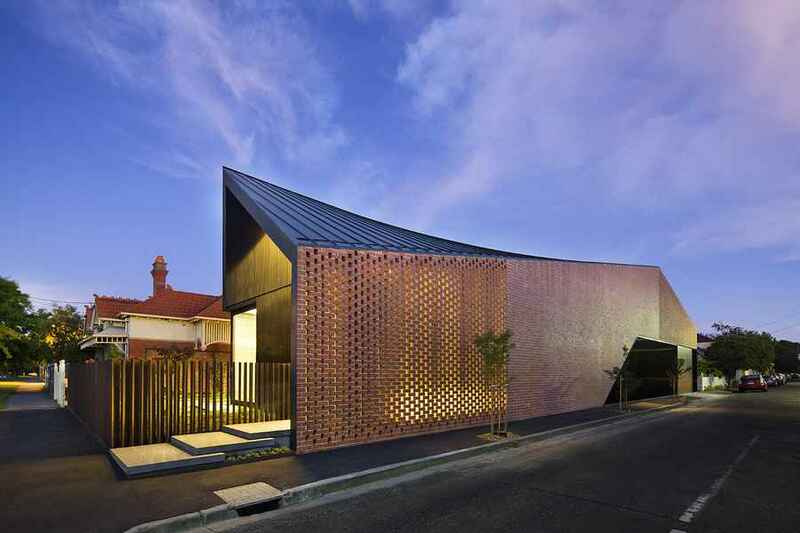 A large projecting roof shelters the pedestrian access, re-created with a cut on the roof and a double parking space. 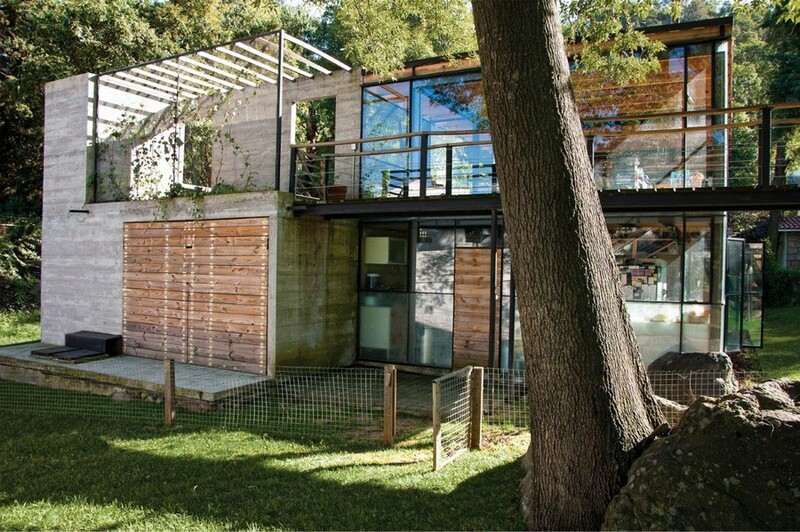 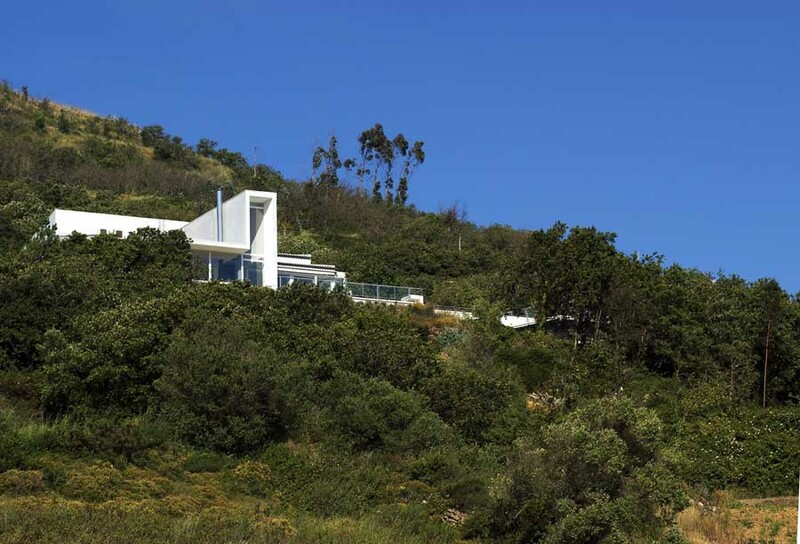 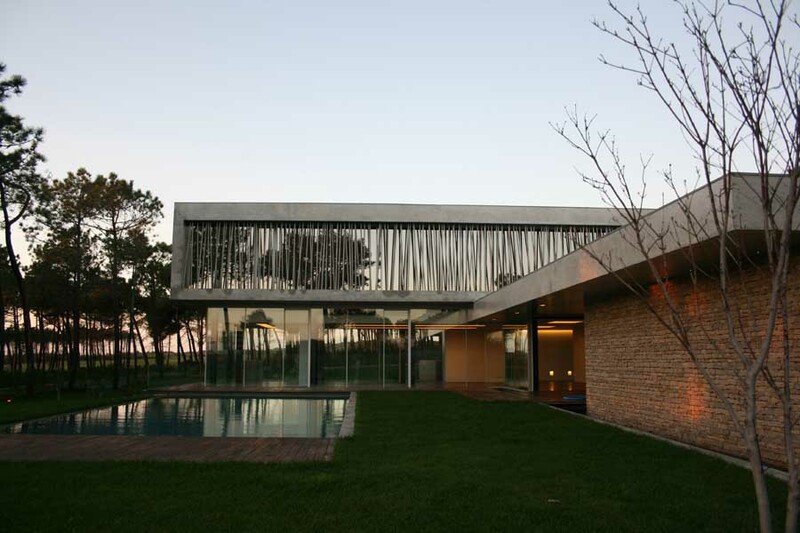 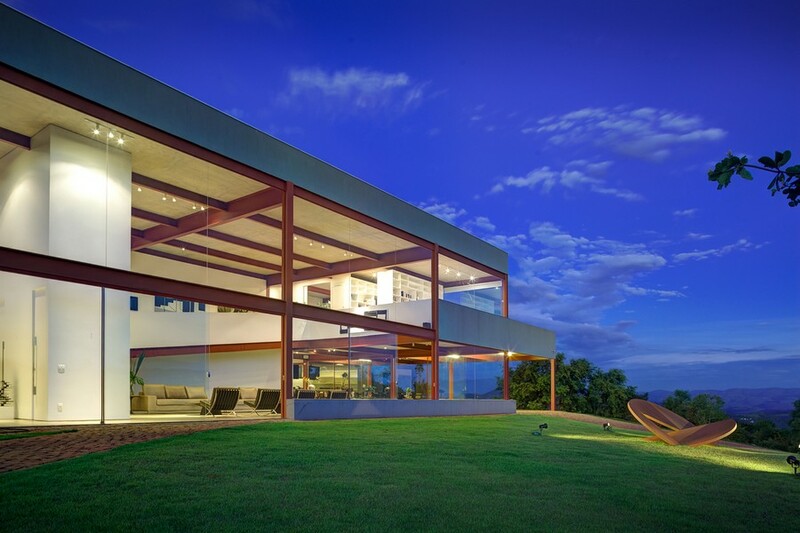 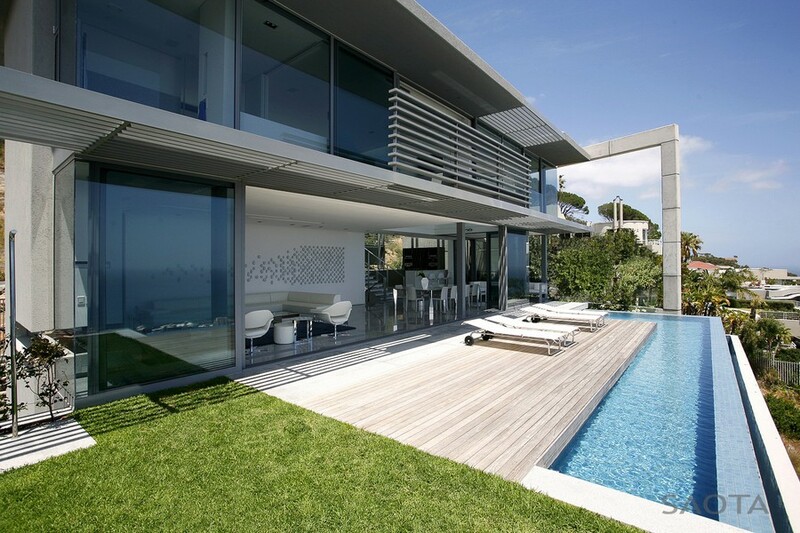 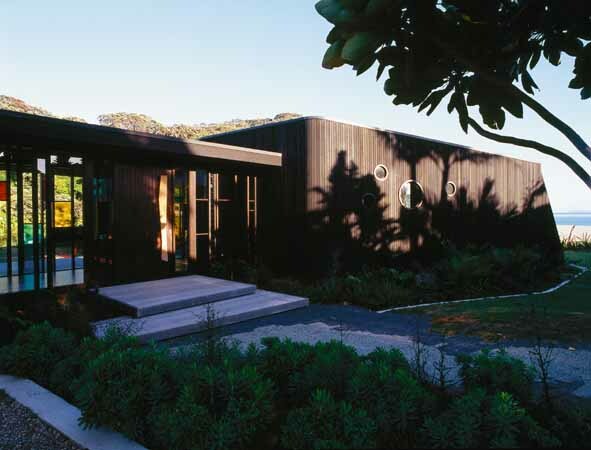 The design concept was to take advantage of the views from the residence to the eucalyptus forest that is adjacent. 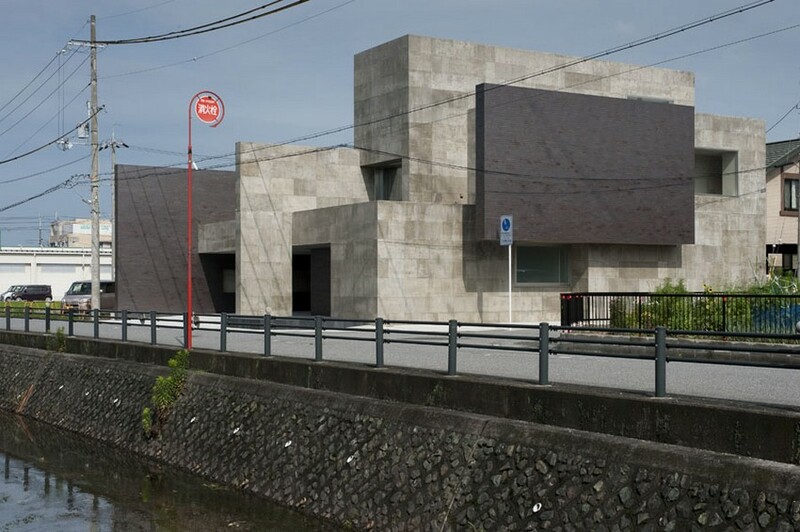 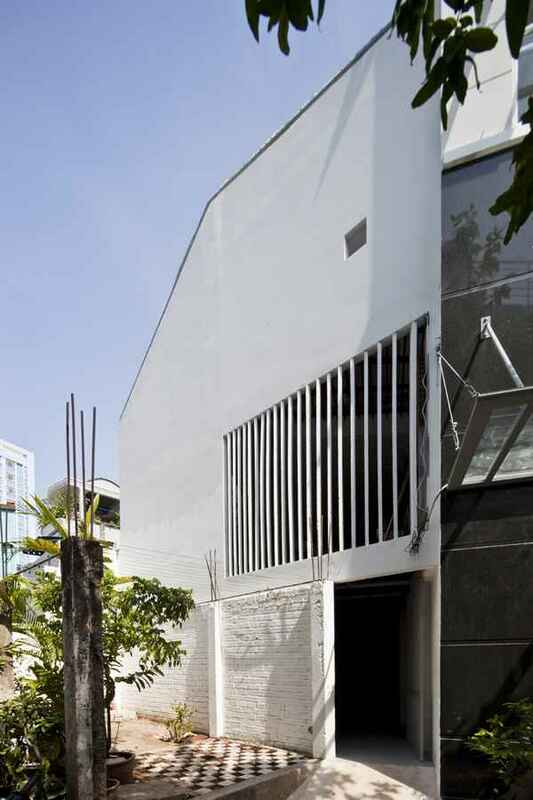 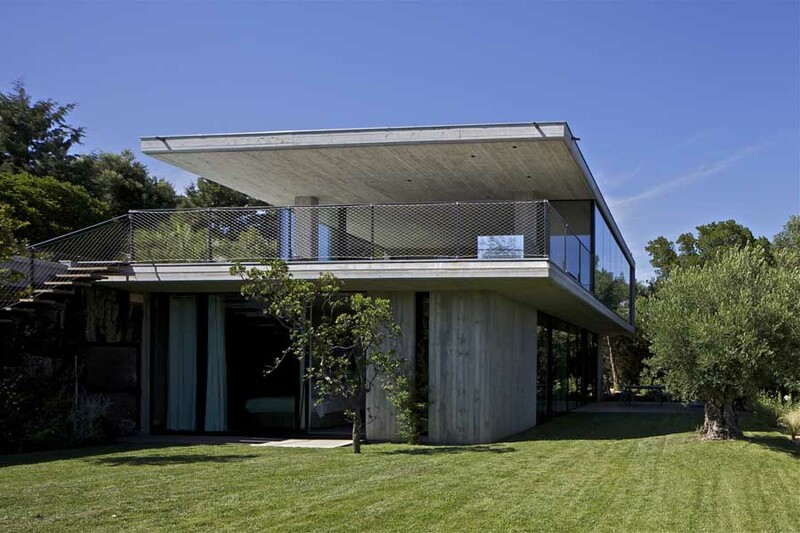 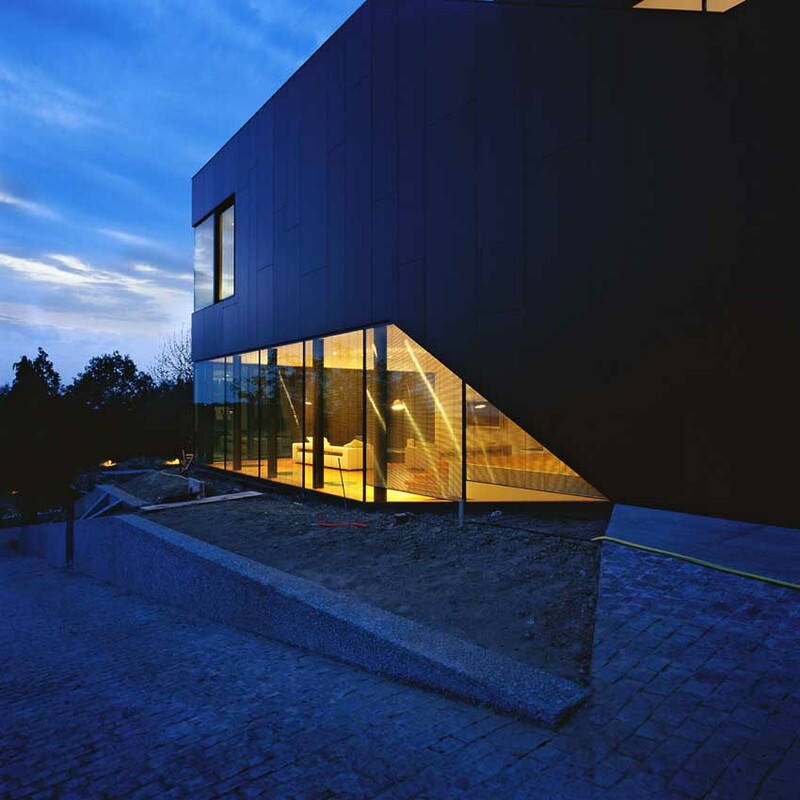 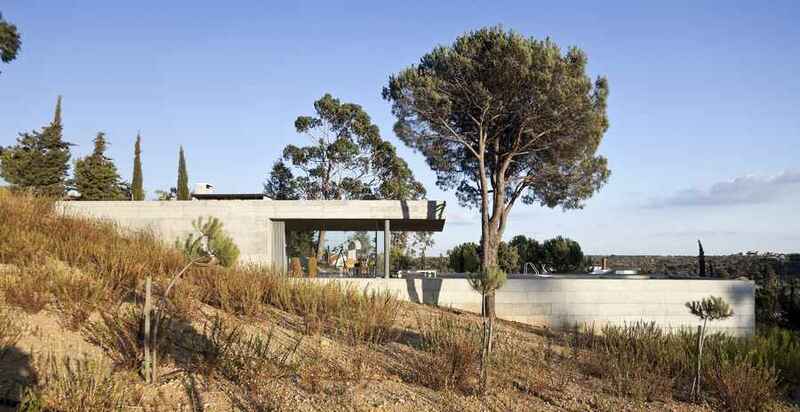 Three slender concrete slabs help form rectangular volume of the building. 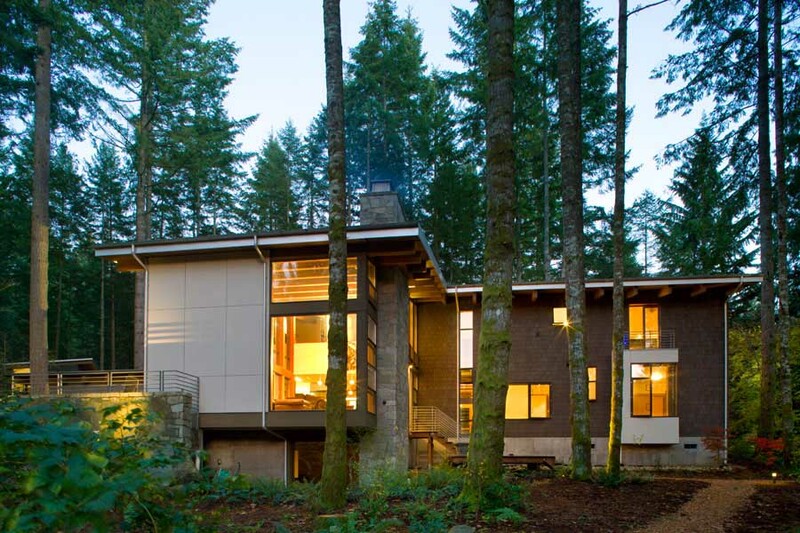 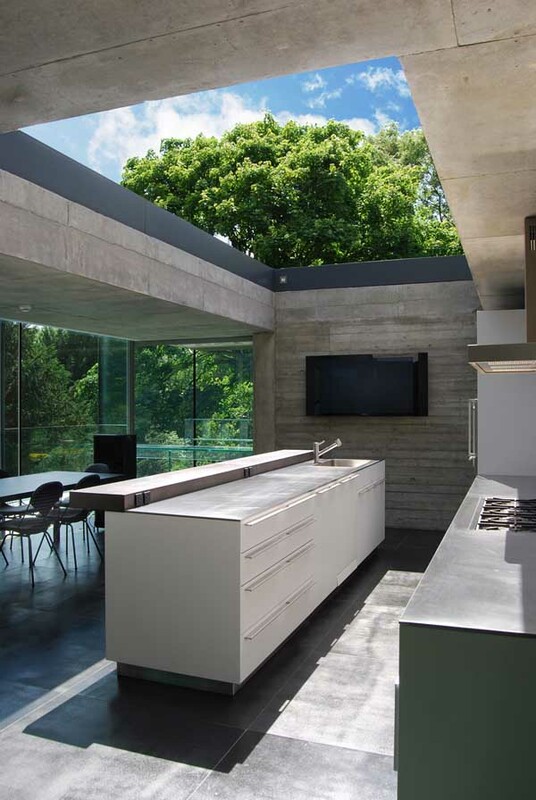 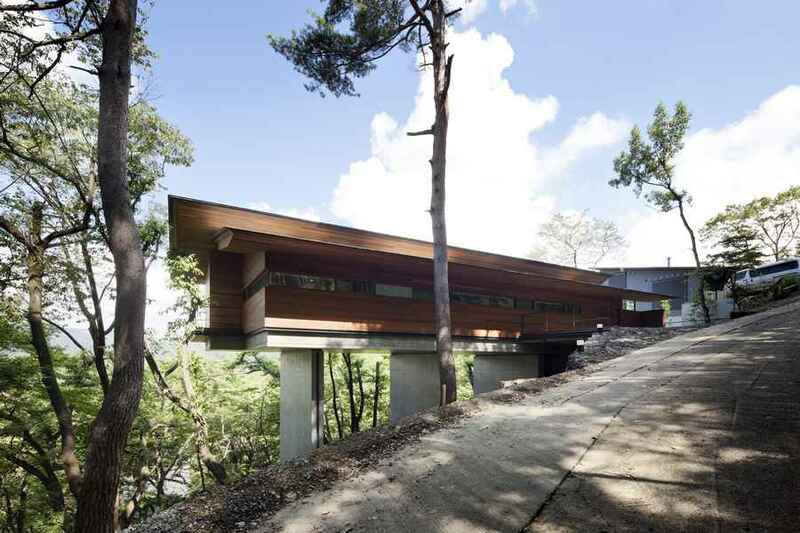 The living spaces sit above ground to allow a better view of the treetops, and to slot the garage in. 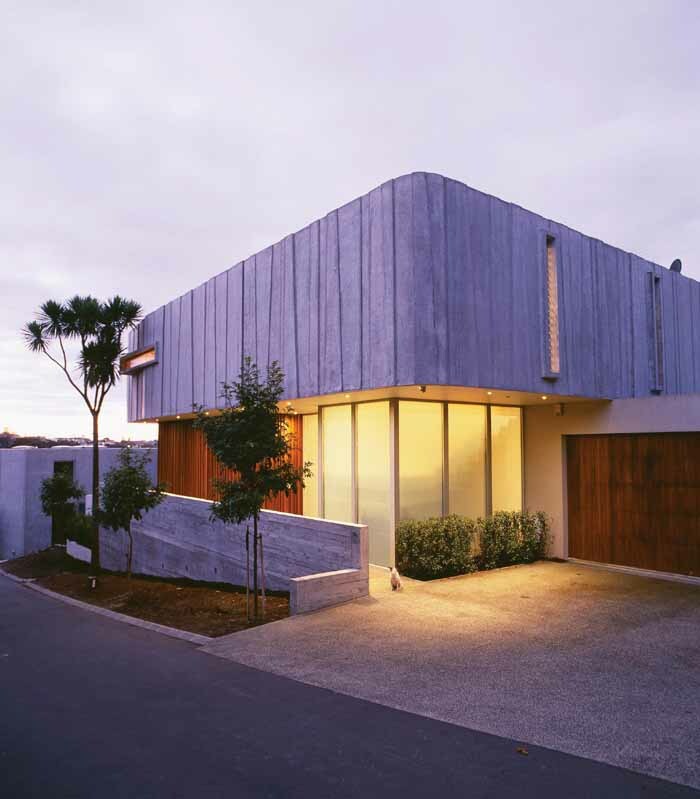 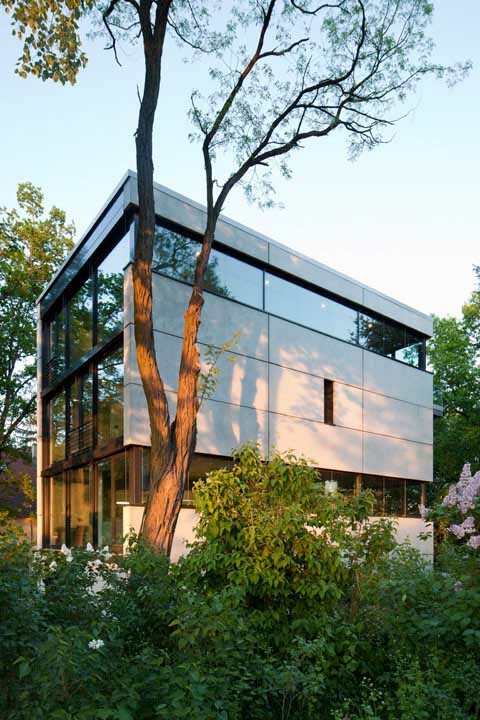 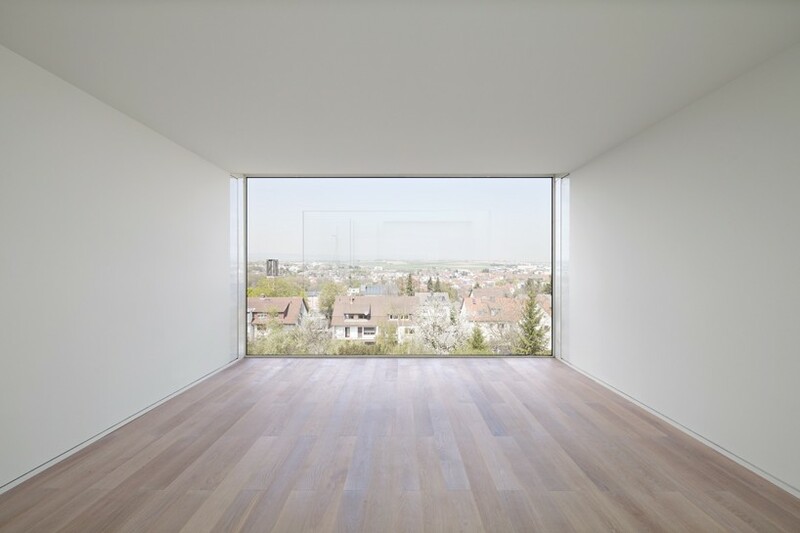 This house is austere and quite impenetrable – the facade materials give it a heavyweight appearance and there are minimal openings. 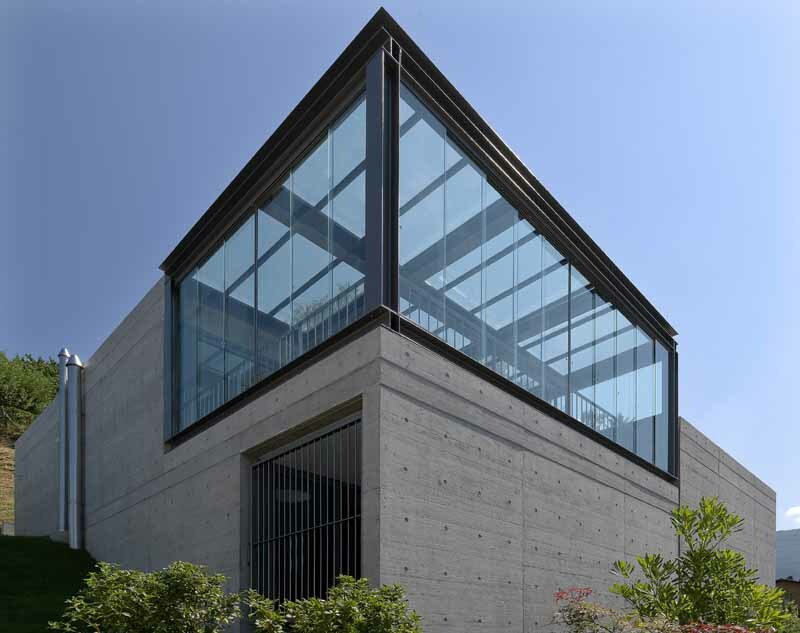 You could say it is an unfriendly building, but inside there are a variety of strong interlocking spaces making for a dynamic introverted architecture. 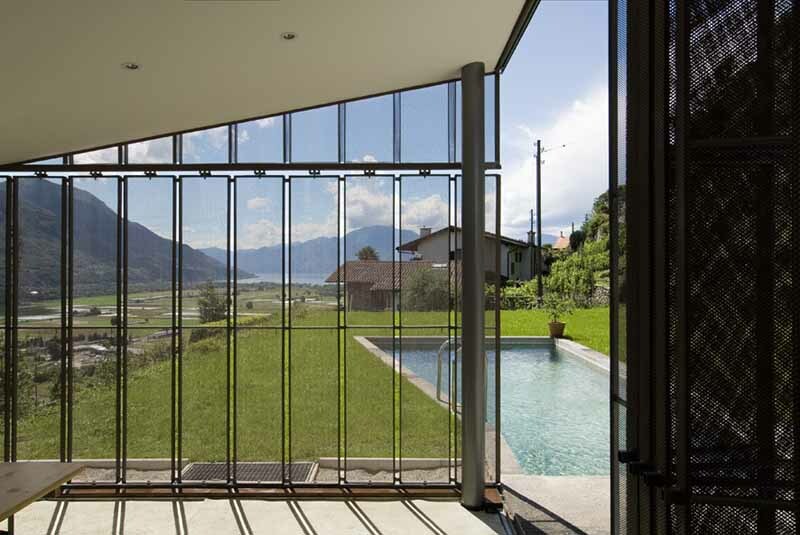 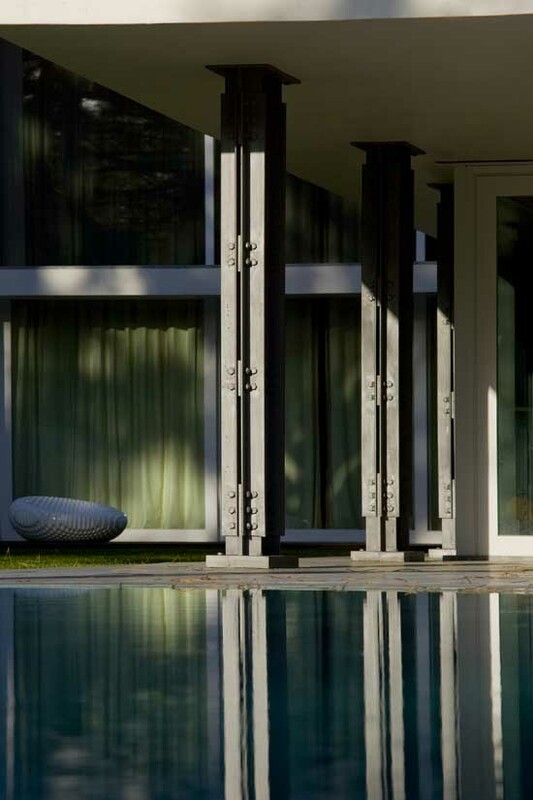 The project M2 is classified as a ‘Klimahouse A’ – an elegant contemporary residence up in the Italian Alps, with generous glazing to the obligatory pool. 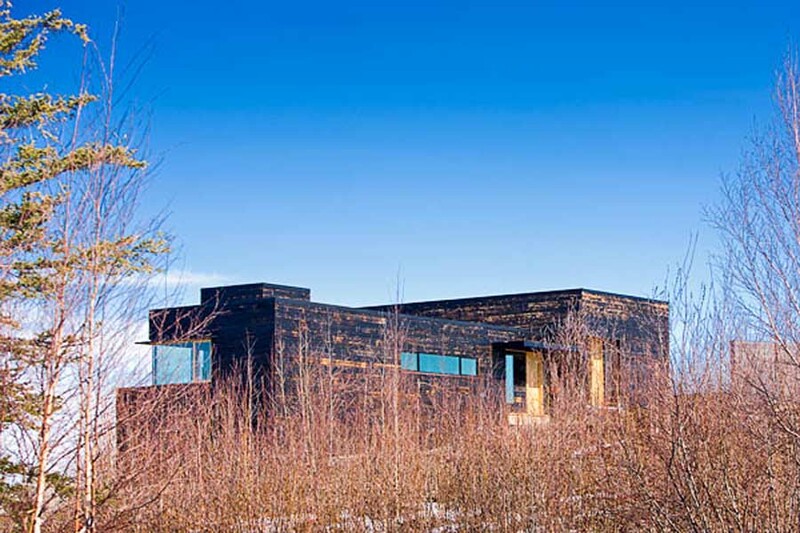 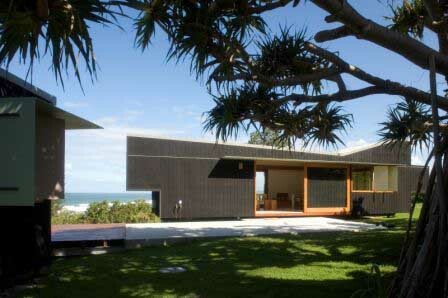 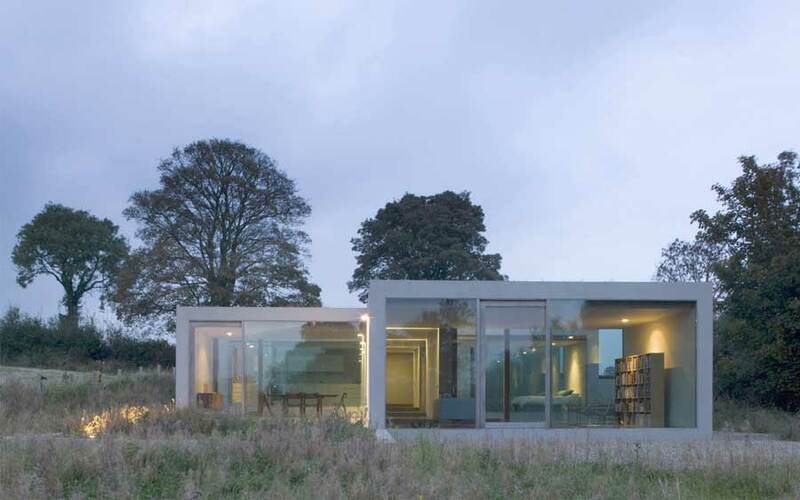 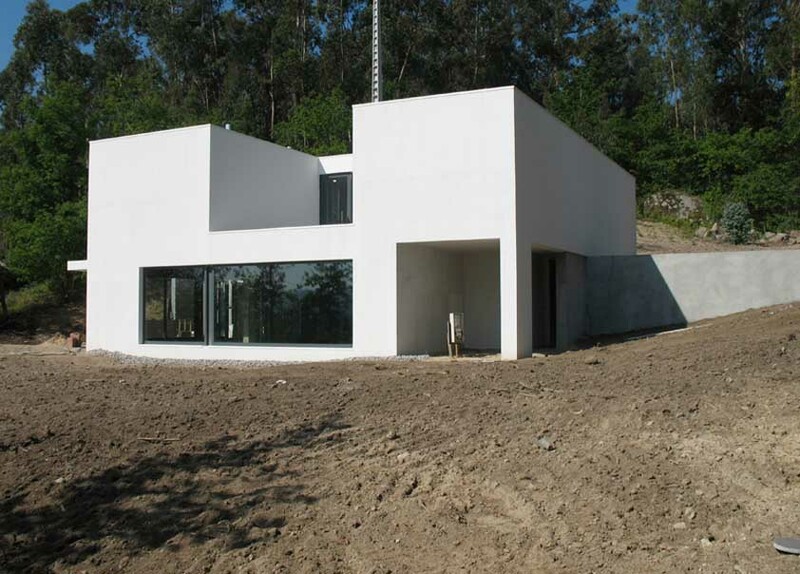 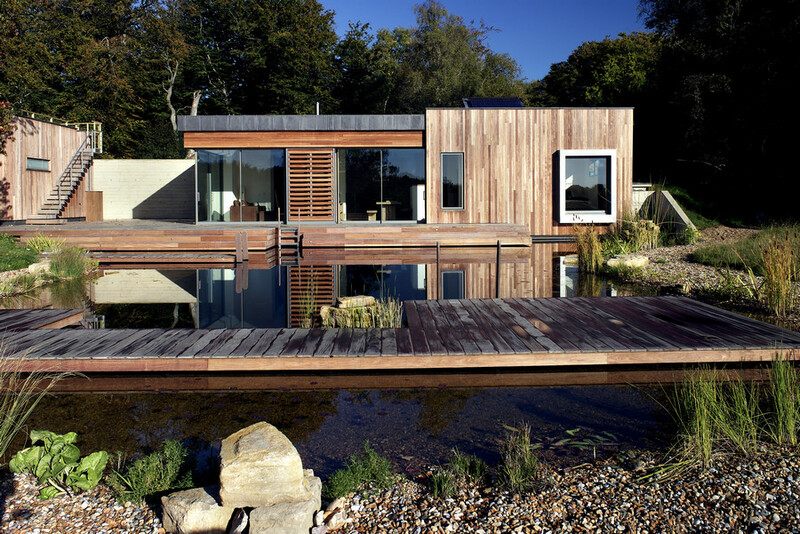 1 Feb 2013 – Respecting the site in its entirety, the project is total involvement with the natural surroundings. 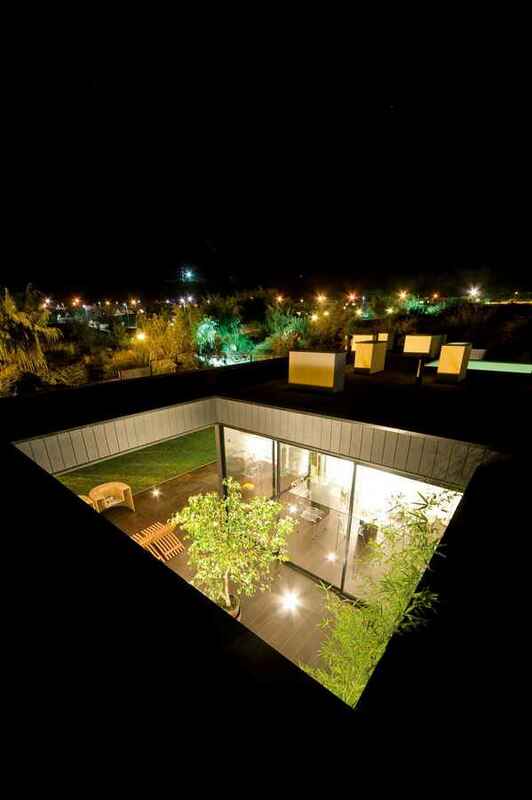 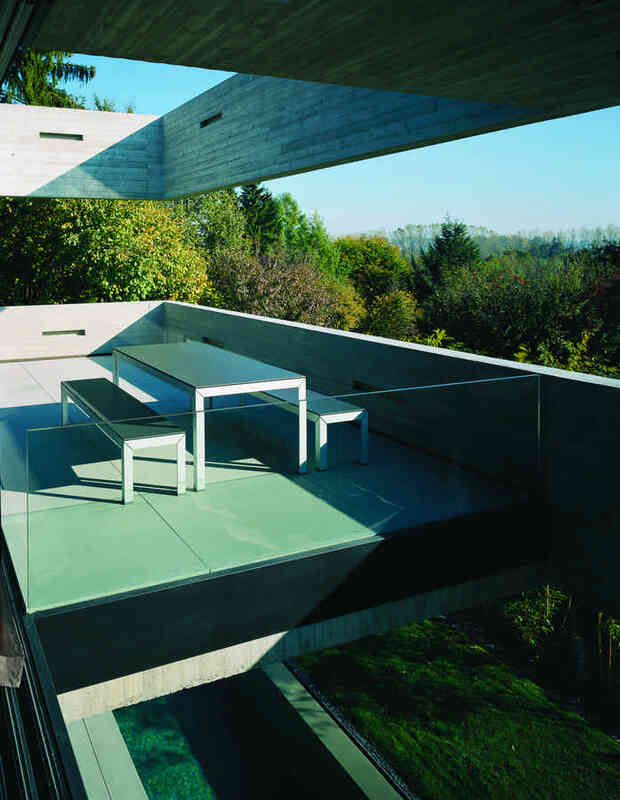 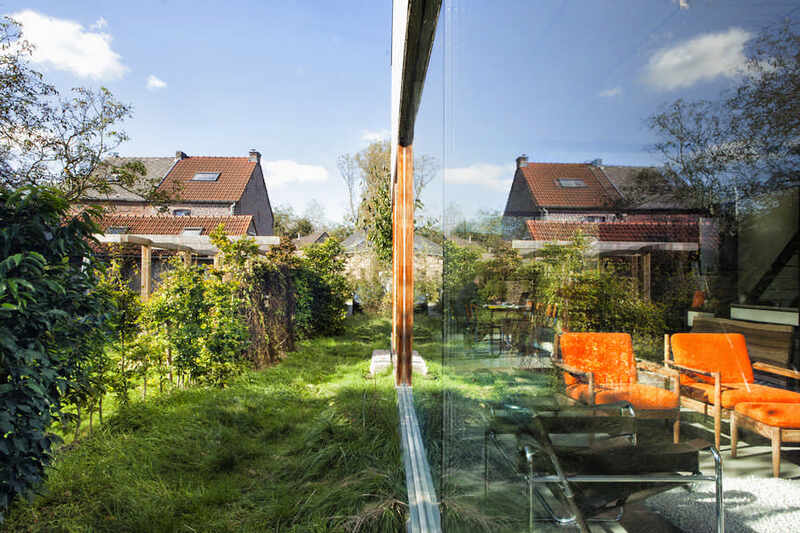 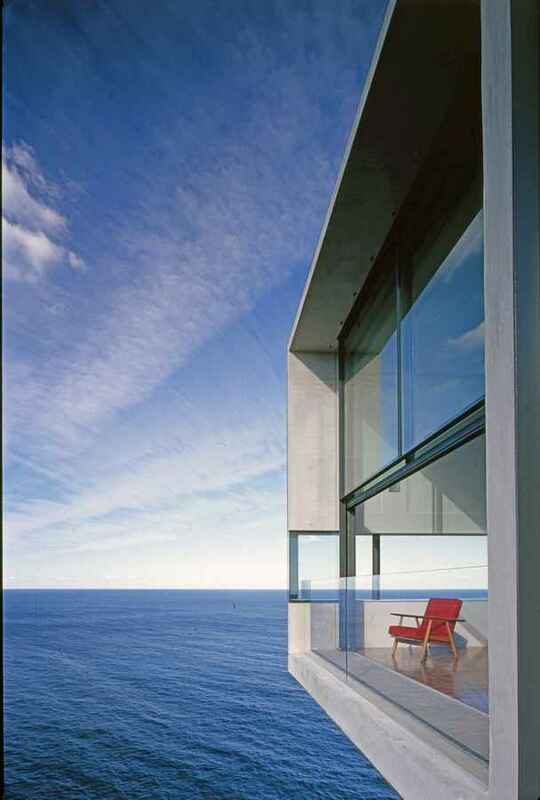 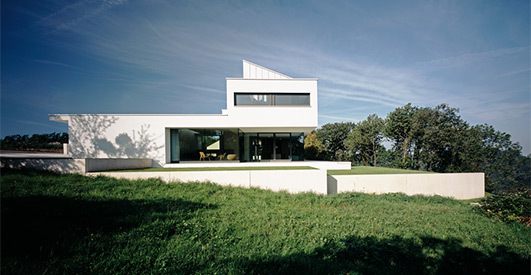 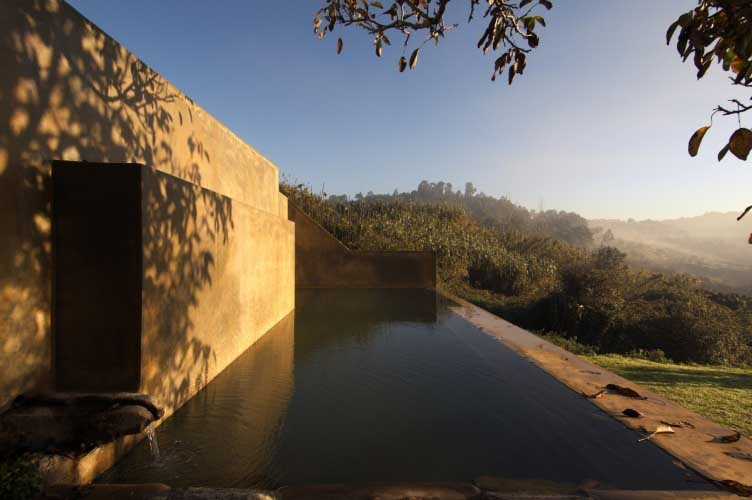 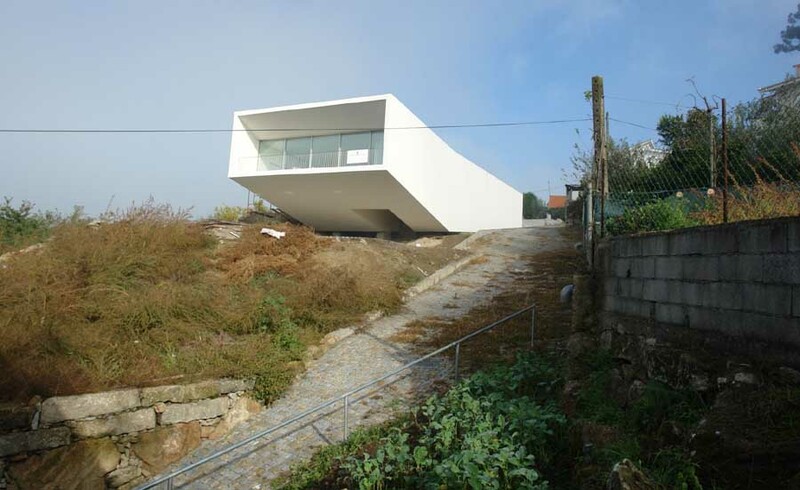 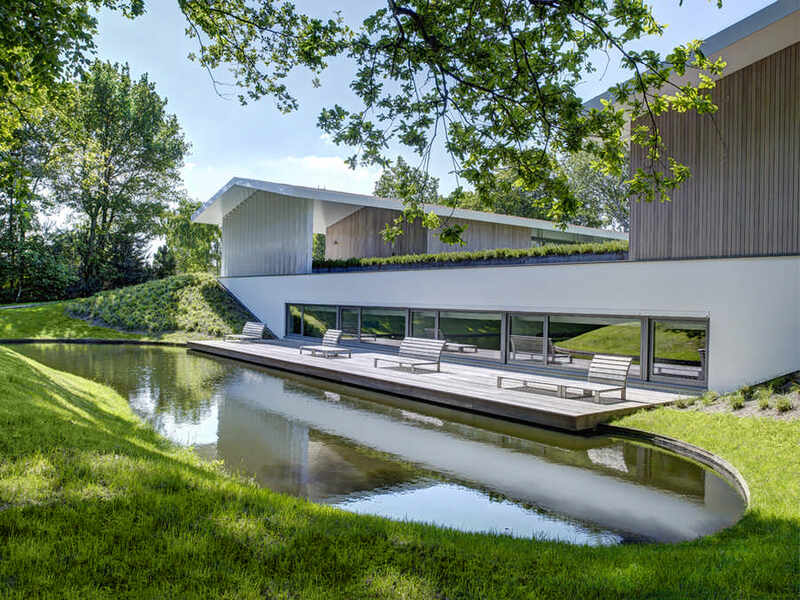 Was privileged contemplation of the landscape, adapting the volumetry of the house to the natural topography. 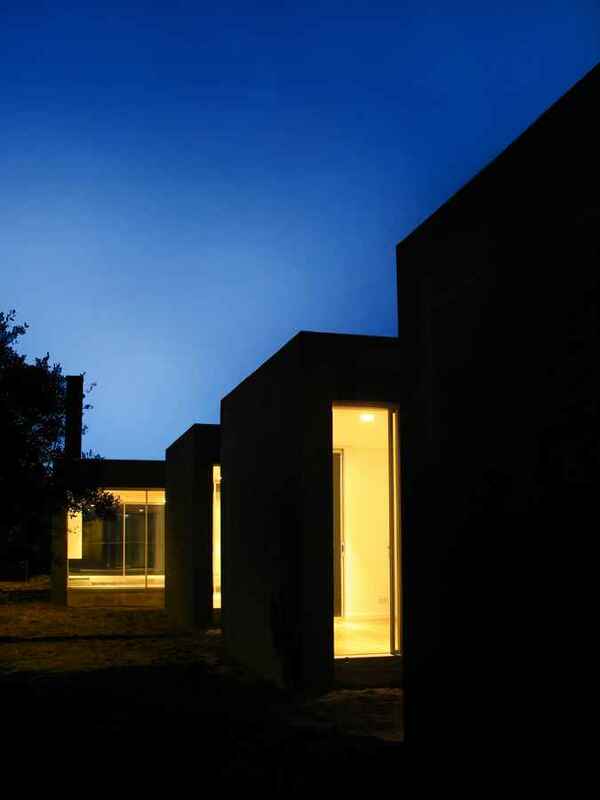 The extremely careful two volumes have been developed in “L” shape. 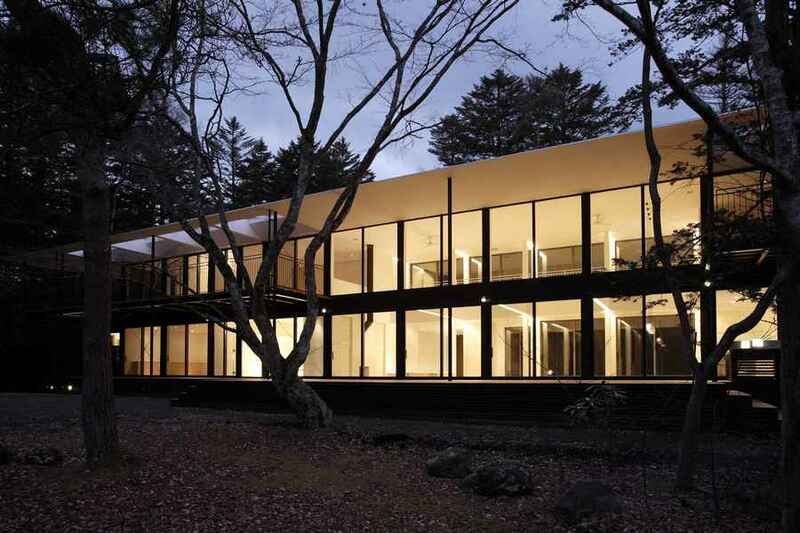 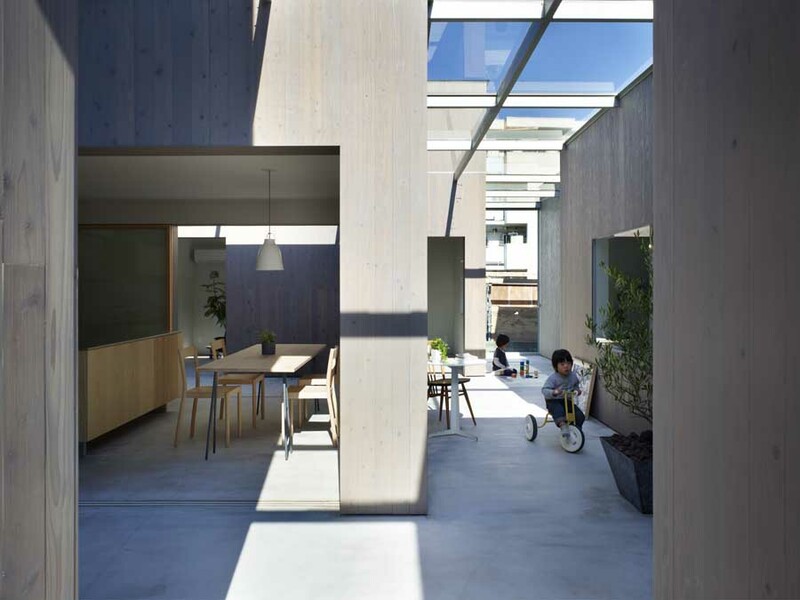 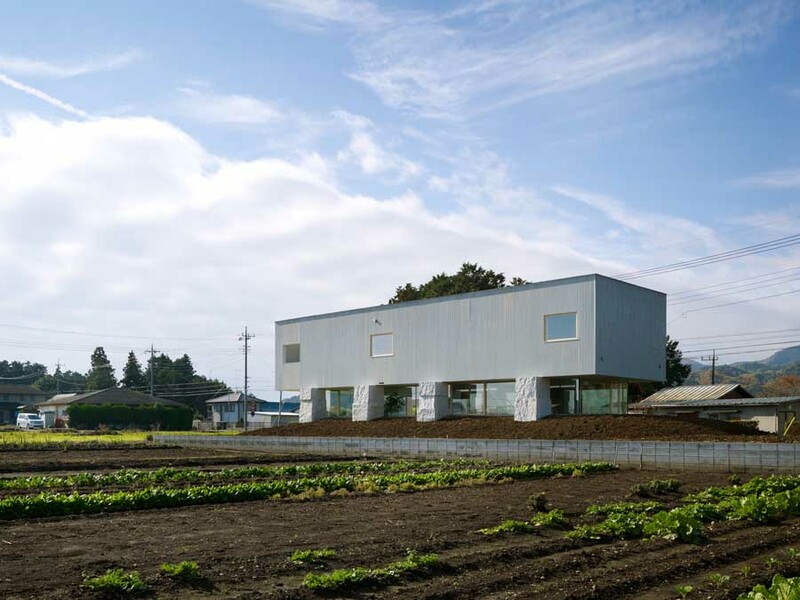 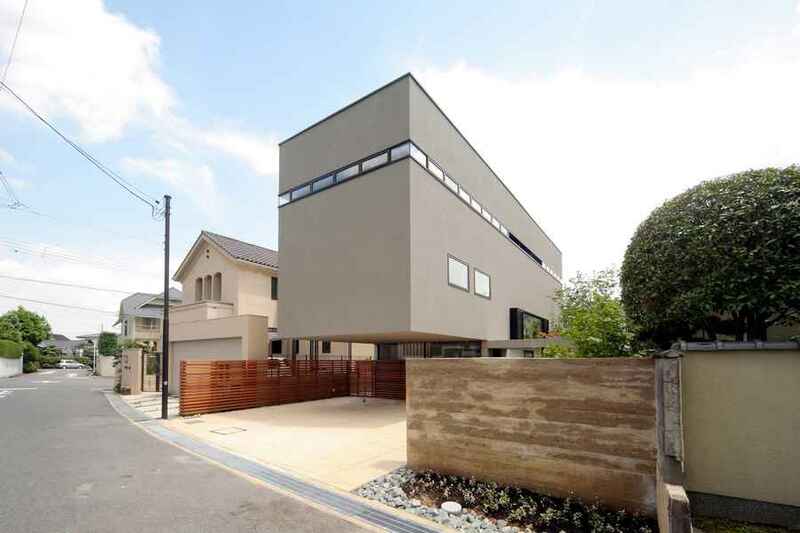 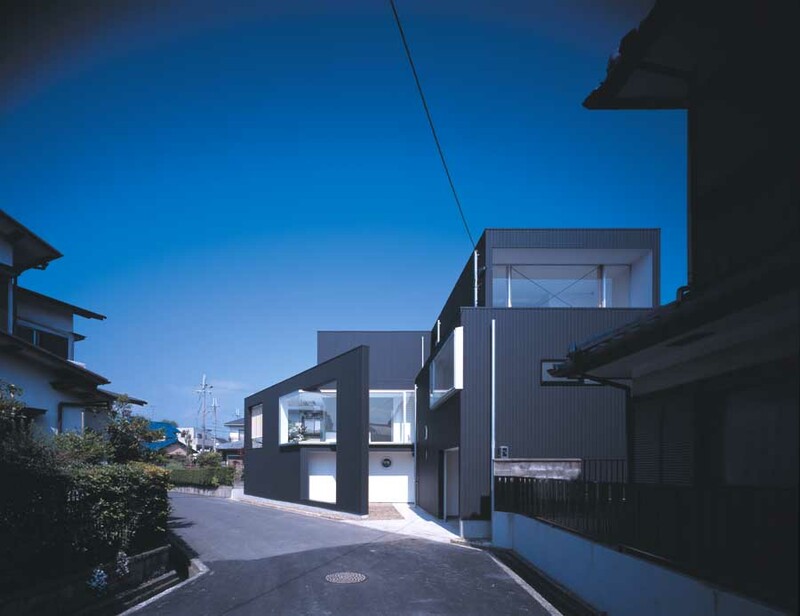 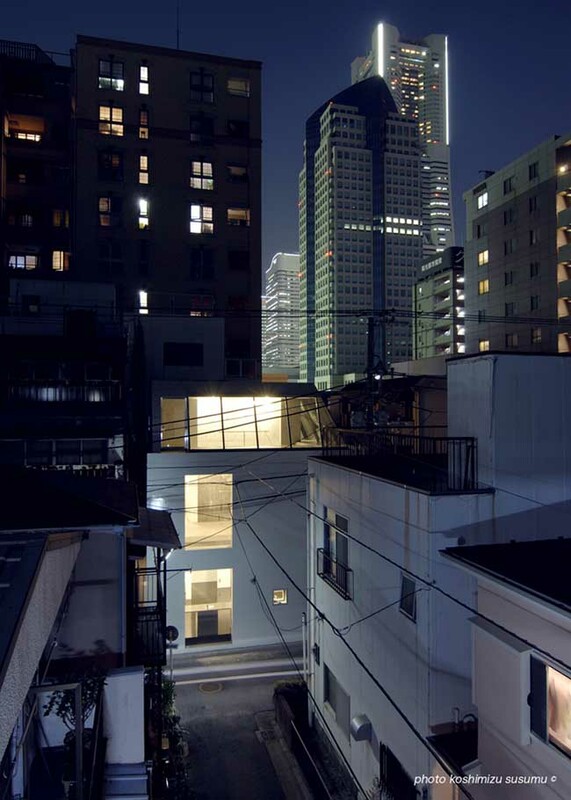 29 Jan 2013 – This is a new residence for a young couple in Abiko City. 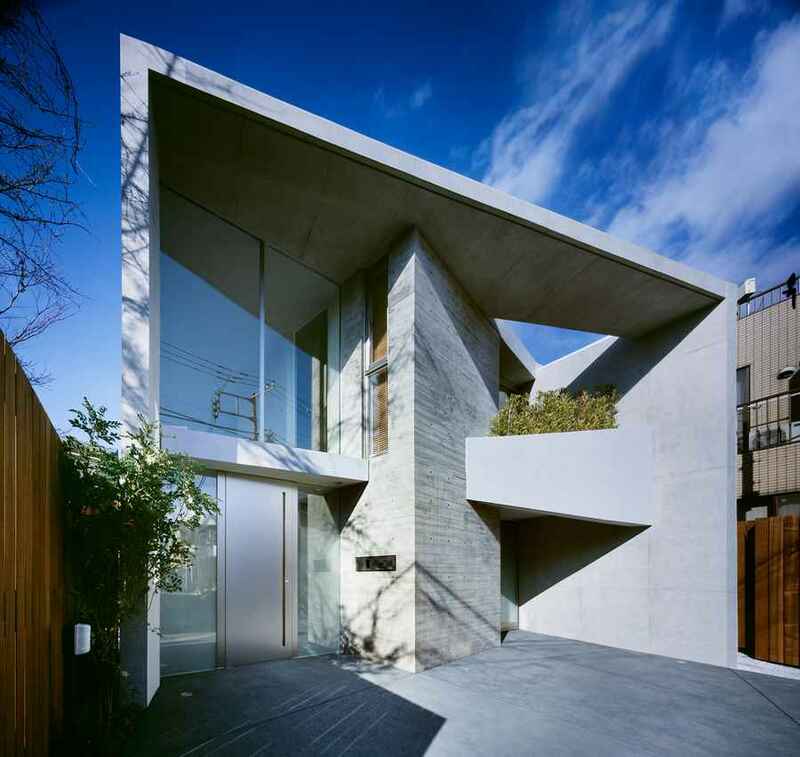 The concrete form contorts in section creating a dynamic shifting street elevation that challenges the rather plain context. 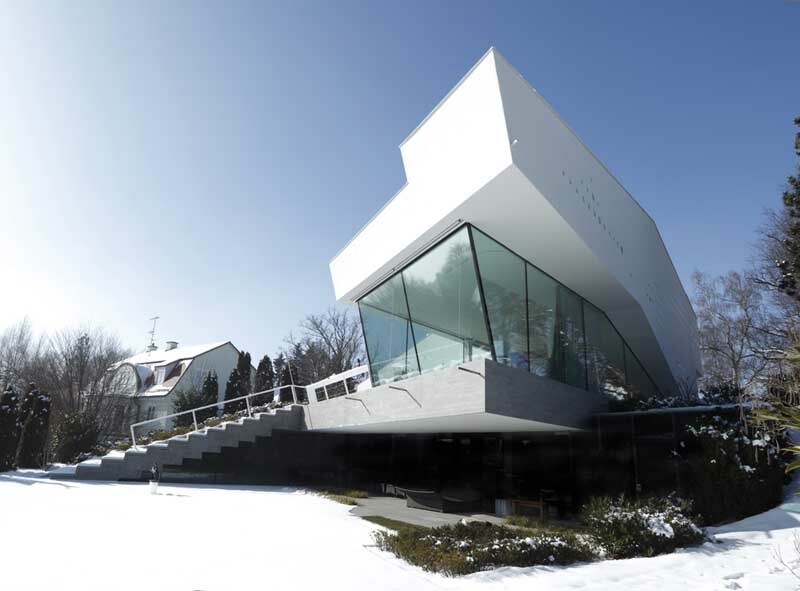 9 Jan 2013 – Located at the alley of Seongbuk-dong where community of village has formed for a long time, ‘H-House’ is a house to keep the meaning to show the virtue secretly. 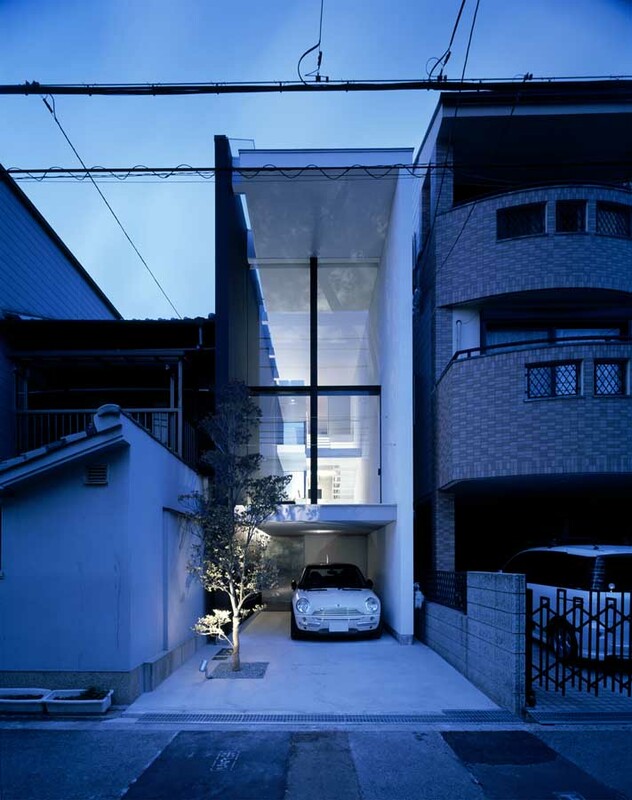 This house reveals itself without clumsy and stimulative feeling in the scenery of old alley, suitably for its name. 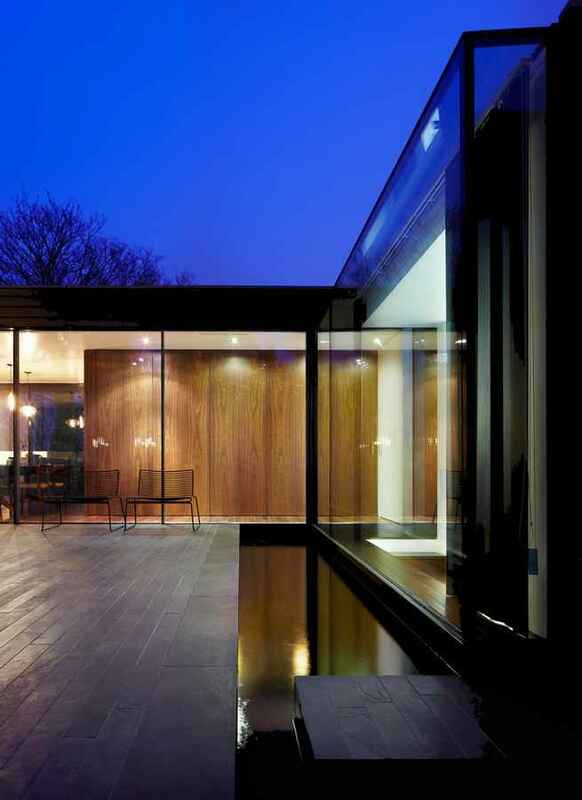 The clients required a four bedroom home for their young family, the design of which had to encapsulate all the qualities of luxury open-plan living while still providing a homely environment. 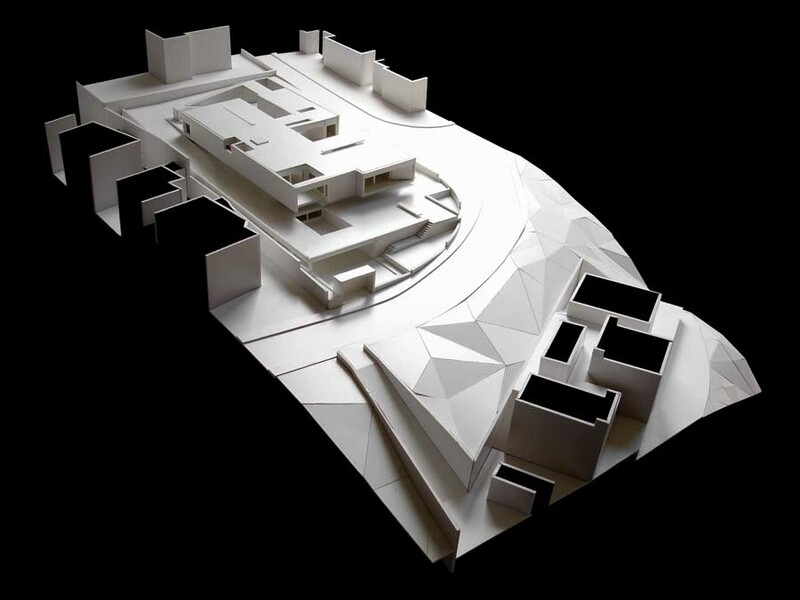 The practicalities of the site – steepness and town planning restrictions – were key initial drivers in determining the parameters available. 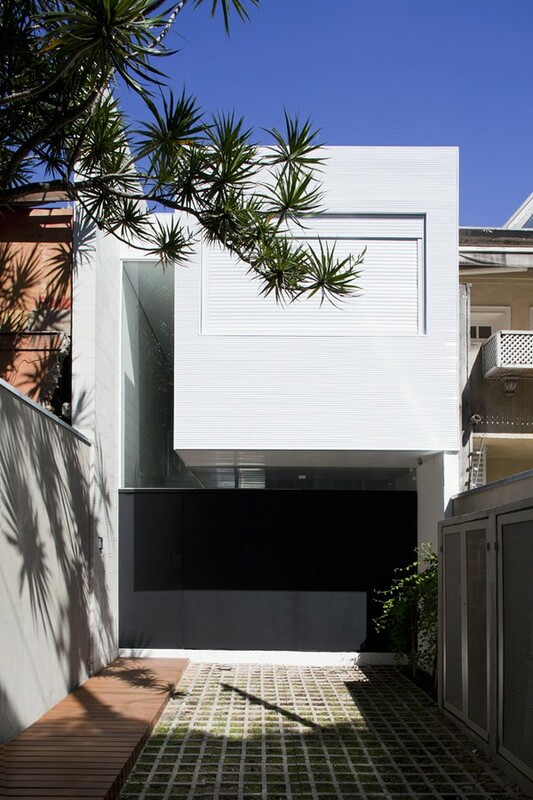 The narrow proportion of the property also necessitated the careful consideration of privacy and bedroom accommodation, which is set back from the street or suitably screened. 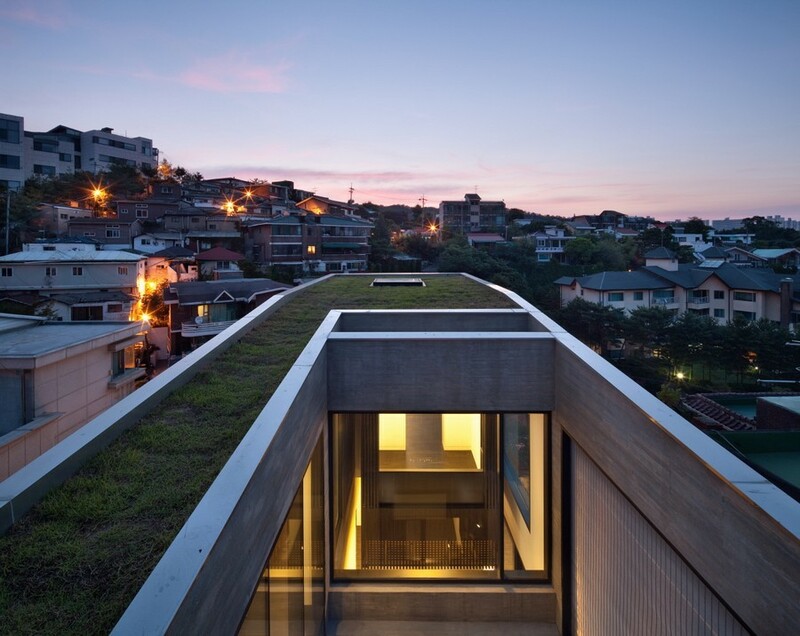 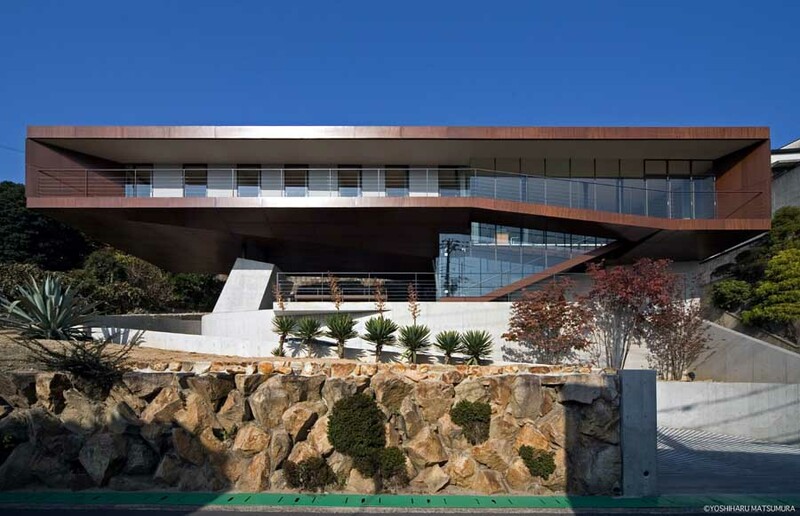 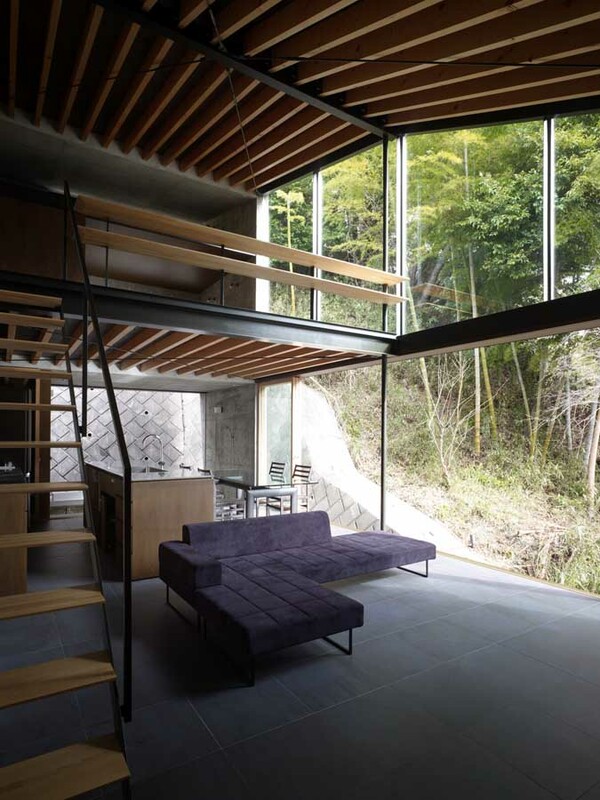 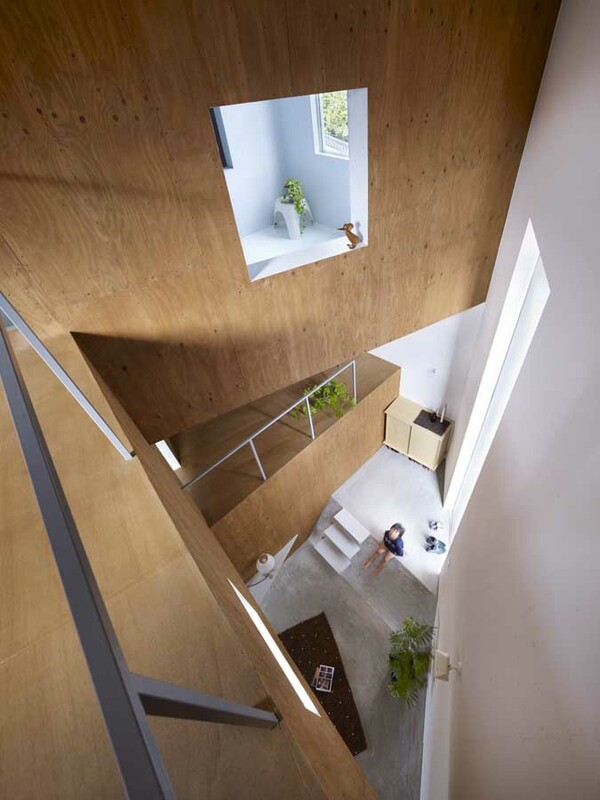 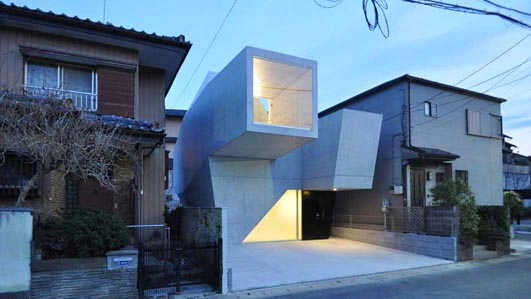 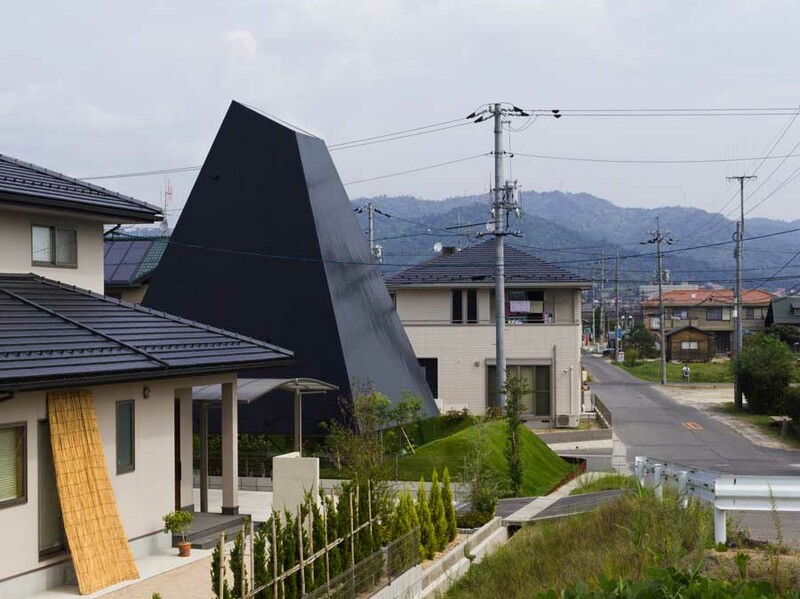 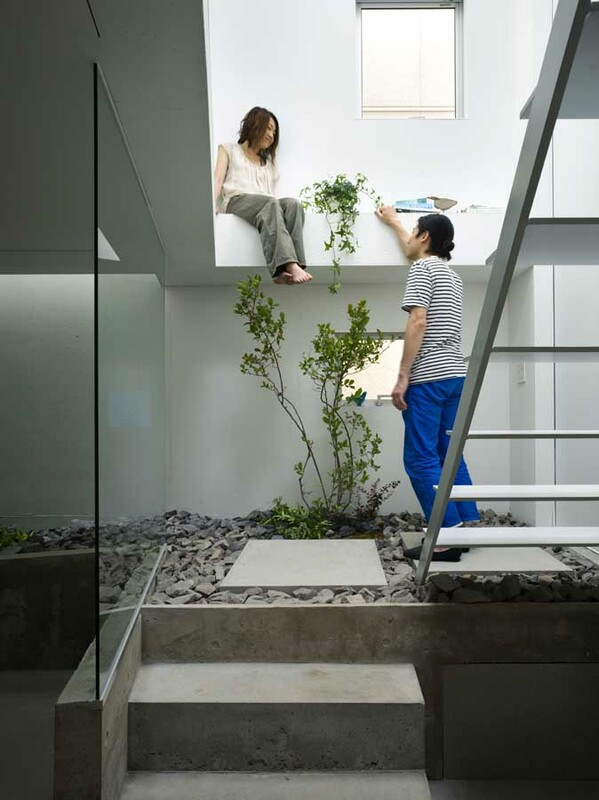 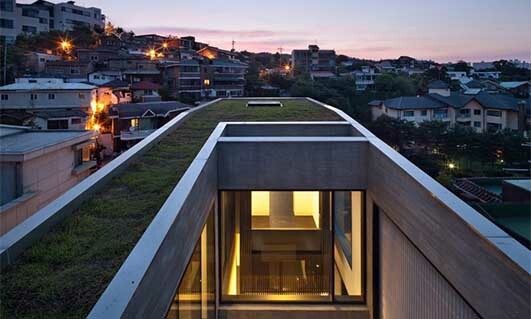 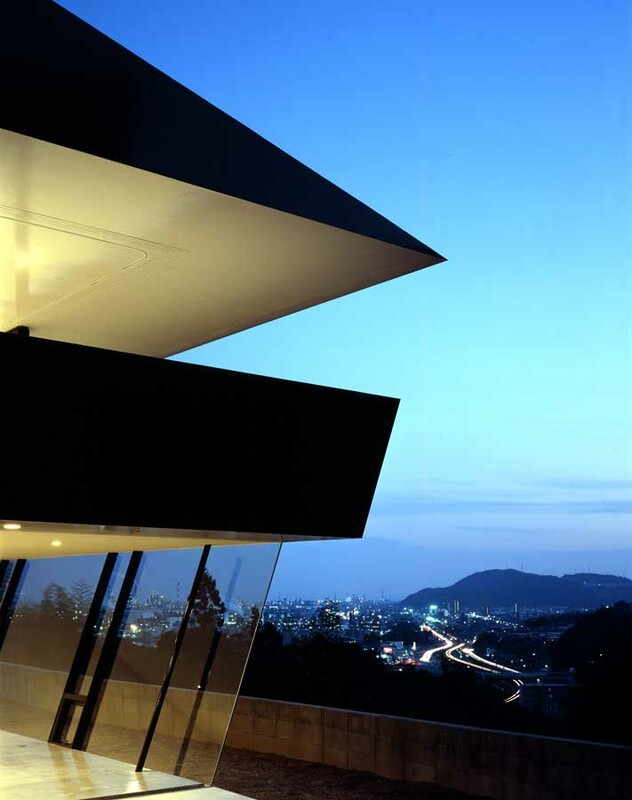 This is a bold new Japanese house that juts out over a steep slope. 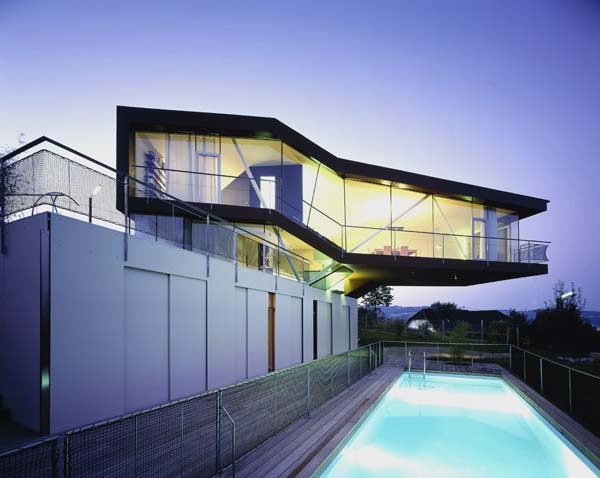 Many houses lie parallel to slopes to capture views from a long elevation, typically from a relaxation area such as a terrace, lap pool or balcony. 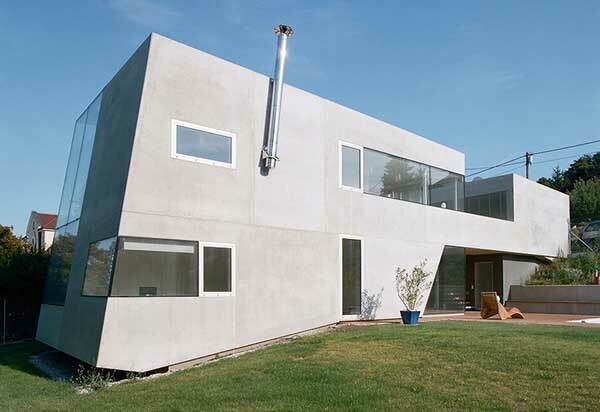 The architects here have thrown convention out the window and decide to twist their house and push it out into the air, an unusual step.